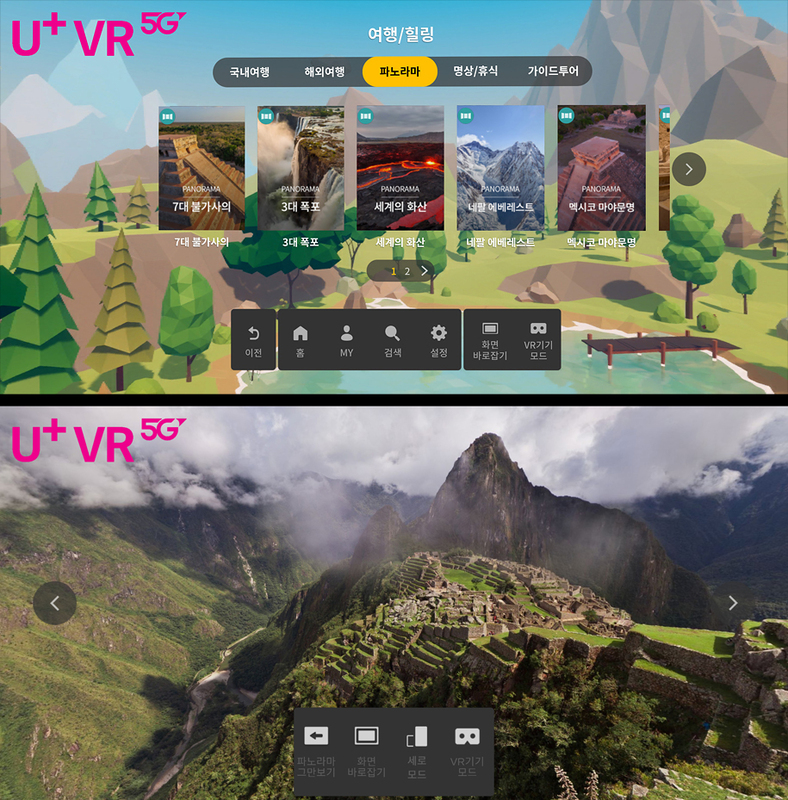 LG Uplus, one of South Korea's main mobile operators, has released the first 5G smartphone and 5G-based VR service, allowing you to enjoy exclusive 3D VR content, as well as 4K UHD VR images that are four times brighter than Full-HD. The vivid content, developed by LG Uplus and leading worldwide manufacturers of 3D virtual reality, will provide its customers a unique experience of VR. And we are incredibly happy to be a part of this revolutionary development, because LG Uplus uses our content too! 5G service allows you to download your favourite movies in seconds, manage a drone without leaving your room, feel the unforgettable atmosphere in the heart of a sports match, look at the smallest details in your favourite TV programs and much more! 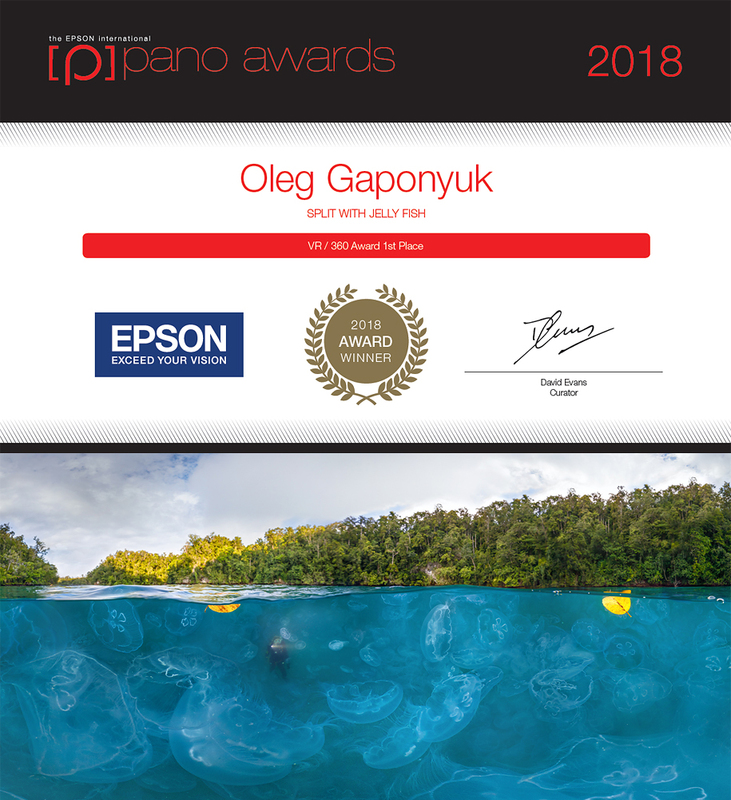 Oleg Gaponyuk has become a silver winner of the prestigious underwater photography contest Deep Indonesia in the Reefscapes nomination with his panorama of the coral reef in the Queen's Gardens archipelago. Also the photo of the "Jellyfish Bay", taken in Indonesia was highly appreciated. And we must mention the contribution of Ivan Roslyakov, who stitched these panoramic pictures. On March, 27, the Pico Interactive company released their new virtual reality glasses — Pico G2 4K. The company used our high-quality content to demonstrate the capabilities of its latest development. 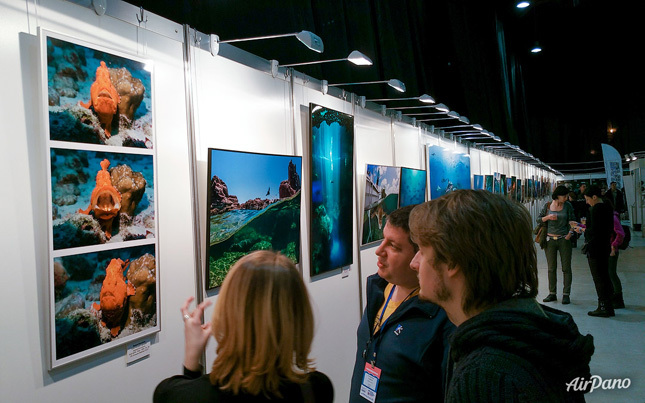 Dive Show – the biggest diving exhibition in Russia and Eastern Europe is taking place in Moscow January 31 – February 3. There you may find our underwater content: photos by Oleg Gaponyuk and Max Guzovsky and 360 videos, which visitors can watch in a VR headset. 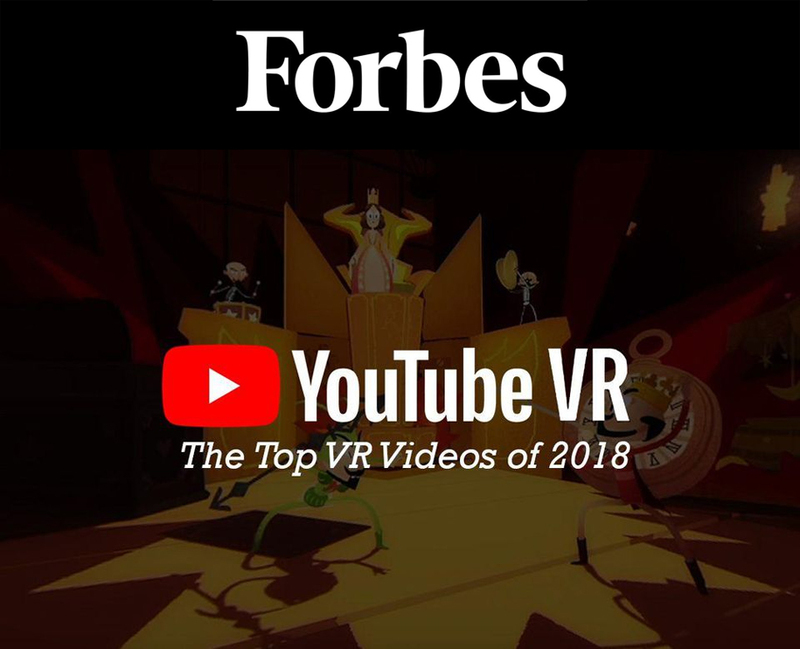 Victoria Falls, The Pearl of Africa Video by AirPano took the first place in Forbes List of 15 Top VR Videos of 2018. The winners of the most prestigious panoramic photo contest Epson International Pano Awards have been announced. 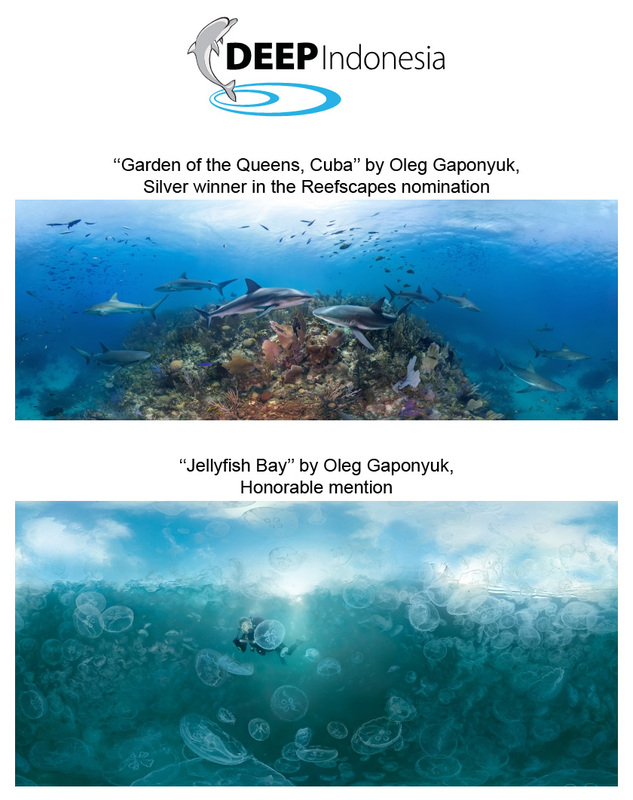 Oleg Gaponyuk took first place in the VR/360 nomination with his split panorama of Jellyfish Bay. Oleg is the winner of the VR category for the third year in a row! Sergey Rumyantsev took the fifth place with his panorama of the Baikal Lake. Apart from that, 4 panoramas by Oleg and 1 panorama by Ivan Roslyakov are in the Top-20. 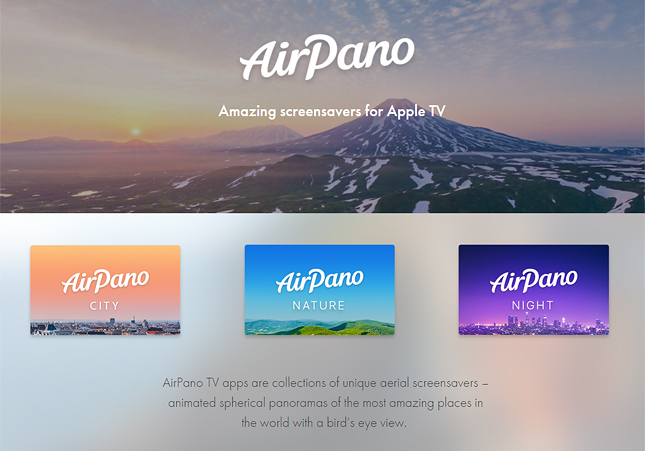 AirPano has been winning in this contest since 2013. 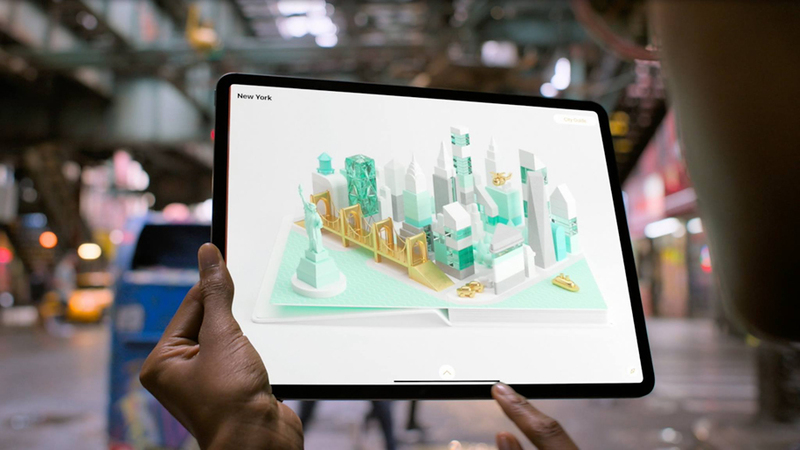 Our app AirPano CityBook is featured in the new official iPad Pro film! 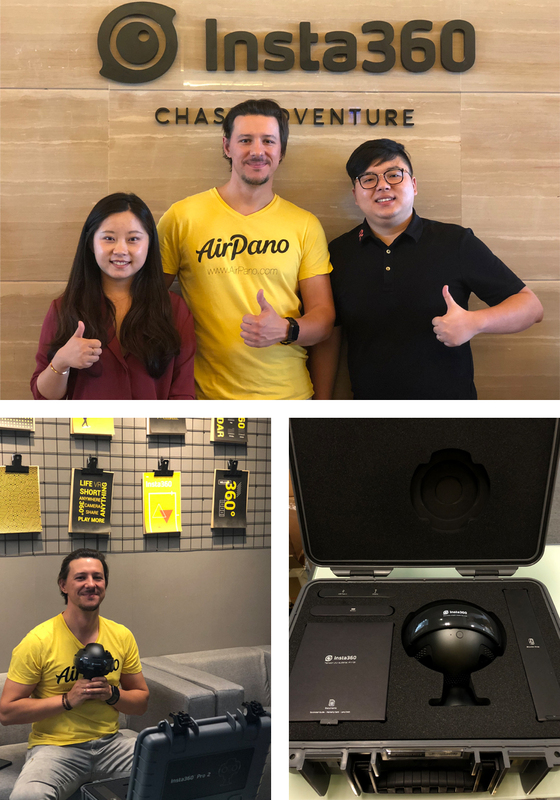 Our cooperation with Insta360 company continues. During our October trip to China we've received the Insta Pro 2, InstaOne X, the FarSight transmitter kit and the StateFlow stabilization system. The updated Insta Pro 2 model will help us shoot 360° stereo videos in 8K resolution, and 360° mono videos in 8K with 60 fps. Insta One X is the most compact option for shooting 360° videos in 5,7K resolution and that gives us the possibility to work in the most difficult and extreme conditions, where it is better not to risk losing or damaging professional equipment. By using the FarSight set we will be able to see on-line what the camera is capturing, even when it is on the drone up in the sky. The StateFlow stabilization system will help us get smooth pictures even when the drone makes fast maneuvers, or when there is strong wind. We've received National Geographic Traveler with our photo inside. The photo of the Great Wall of China made by Dmitry Moiseenko for AirPano. The international exhibition and conference Laval Virtual Asia 2018, dedicated to the technologies of augmented and virtual reality, has opened today in China. 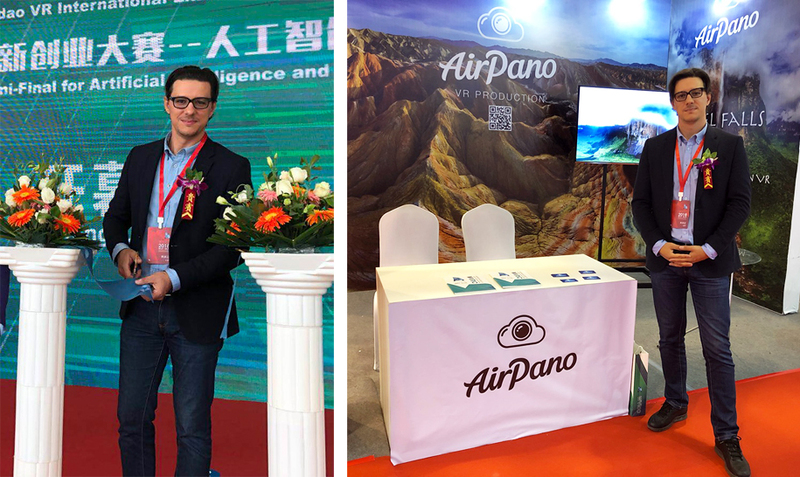 AirPano CEO Sergey Semenov went there to represent our project. Astronauts see the Earth as glorious blue ball. But you don't need to fly to the Space to see the beauty of our planet. Just watch our video, where we have combined the best "planets" of Russia. There will be a following of the most interesting planet views of the world. 4 years after our app AirPano Travel Book has been relased, Apple continue to pay attention to it. This time it was on WWDC, Apple Worldwide Developers Conference. The conference take place in San Jose, USA from 4 till 9 June. AirPano is participating in the International Conference about Virtual Reality and Panoramic Photography — IVRPA 2018. This event is now taking place in Tokyo from May 29-31, where our company is represented by Sergey Semenov. Today our video was featured at the Cannes Festival! A 37-minute movie called «Journey around the World» about the most amazing attractions of nature (including the Arctic and Antarctica, America and Asia) was presented in a special VR section. 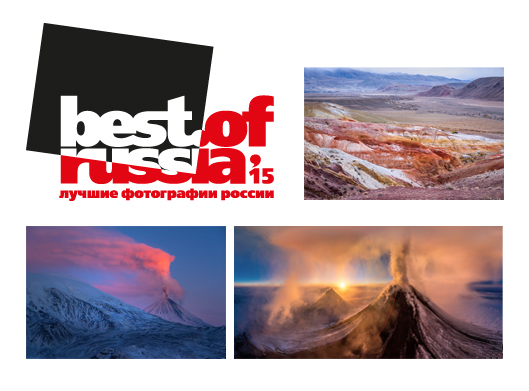 The anniversary and final exhibition of the largest photo exploration in Russia — The Best of Russia — takes place from 22 March till May 13 in the center of contemporary art "Winzavod" in Moscow. Sergey Semenov has become the winner in the category "100 best photos throughout the history of the project" with his photo of St. Basil's Cathedral in Moscow. 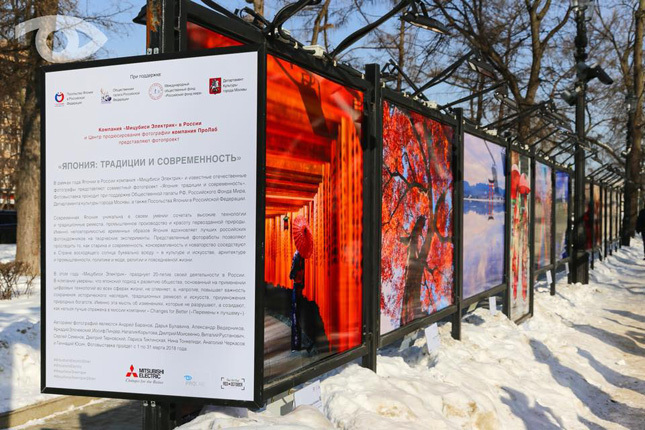 "Japan: traditions and modernity" open-air exhibition is taking place in Moscow from 1 till 31 March. Among the photos of Japan by Russian photographers there are 5 made by our photographer Dmitry Moiseenko. 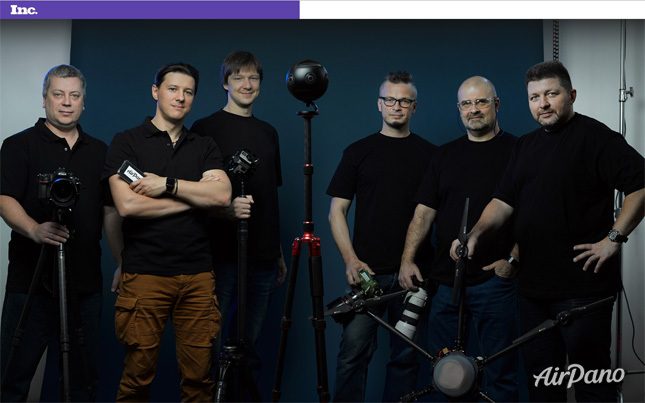 The Inc. Russia Magazine has published a big article about AirPano. You can read about our story of success here. There is a Moscow Dive Show 2018 from 1 till 4 February. Besides underwater photos by Oleg Gaponyuk, there are underwater 360° videos in VR headsets, filmed by our great author Alexey Tishchenko. About AirPano in Japan: there is an article about our us on the centerfold of the magazine about 360° content industry. The readers of the most popular Japanese newspaper Asahi Shinbun found out about AirPano through the publications on the website. We're pleased to tell you about our friend Ádám Plézer, who is the author of the virtual tours of French Polynesia and the Seychelles. The most prestigious panoramic photo contest “Epson International Pano Awards” can finally announce its winners. 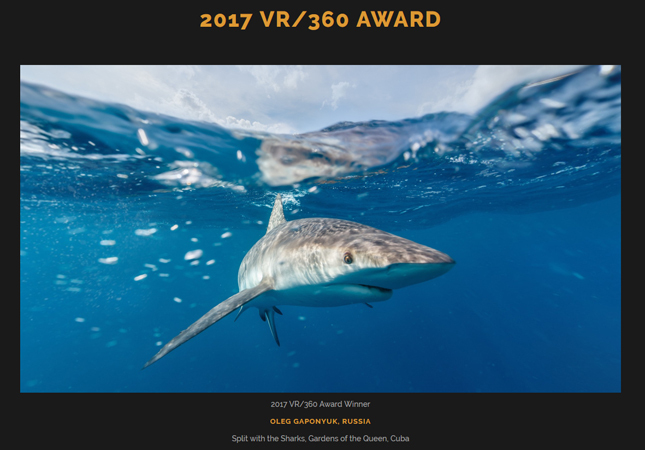 Oleg Gaponyuk took the first place in the VR/360 nomination with his underwater panorama, taken in Cuba. He also got the second place. He repeated his success in 2016, when he won in the same contest. The third place goes to Stanislav Sedov with his panorama of the Angel Waterfalls in Venezuela. You can find 6 works by AirPano in the Top-10. AirPano has been winning in this contest since 2013. 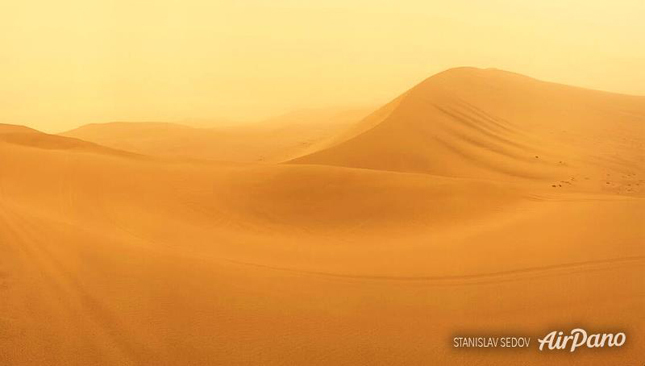 13 photos by AirPano are shown on the "Planet of Contrasts" exhibition by National Geographic Russia. Exhibition takes place on Mega Khimki Mall in Moscow, from 5 till 29 October. AirPano continues to please us by showing wonderful places of our planet not only virtually! 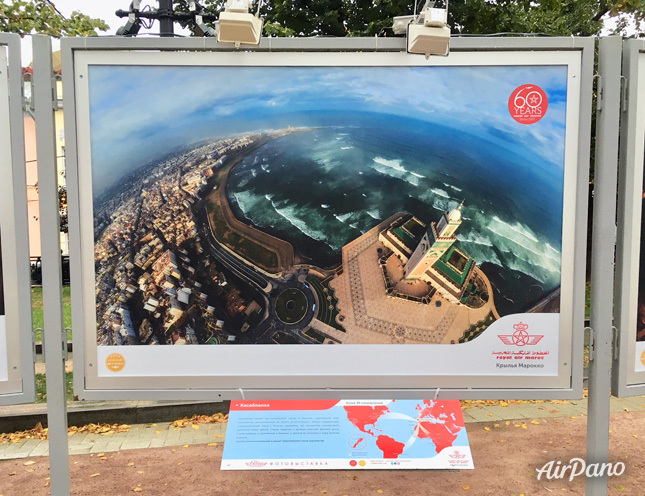 Anyone in Moscow can visit the open-air exhibition "60 years on the wings of Morocco" for free. This exhibition is devoted to 60 years anniversary of the Royal Air Maroc company. Visitors of the exhibition have a chance to win 2 tickets to Morocco, if they publish photos in Instagram with required hashtags and mentioning of the airline's profile. 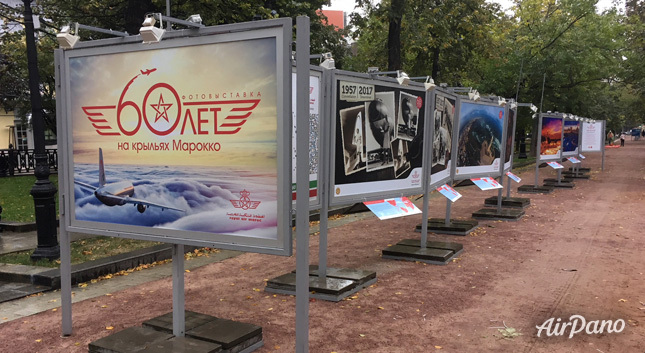 The exhibition is taking place on Tverskoy Boulevard, Moscow from 19 September till 19 October. 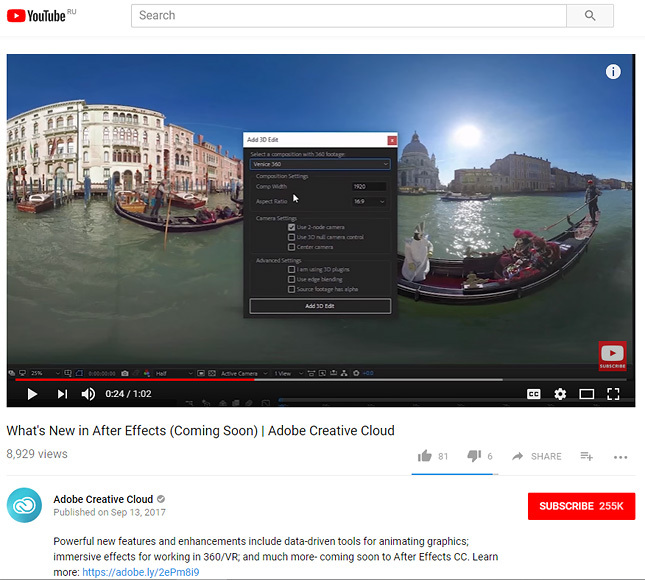 Adobe — the absolute world leader in the development of computer graphics software — advertises a new version of the Adobe After Effects application, using the video made by AirPano. When professionals of this level trust you, this is not only the reason to be proud of, but also an objective indicator of the quality of the works we create! 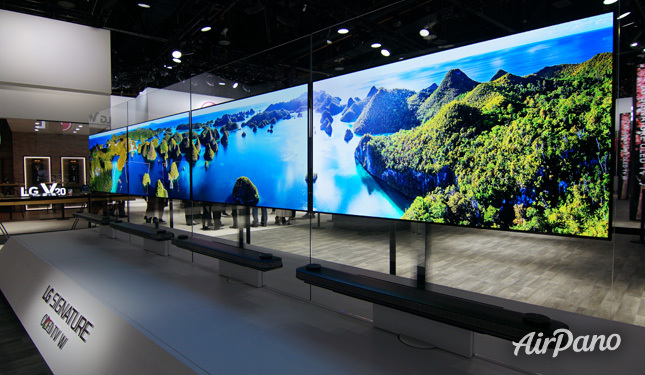 LG uses AirPano ultra high resolution panoramas to demonstrate high quality of LG screens. 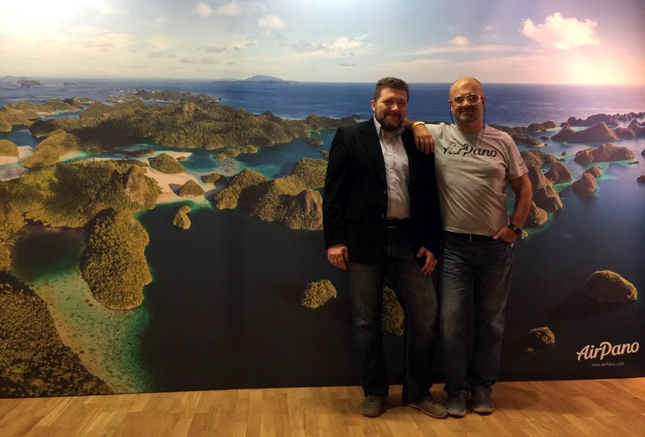 On the photo: panoramas of Raja Ampat archipelago in Indonesia with 124 and 292 megapixels resolution on CES exhibition in Las Vegas. 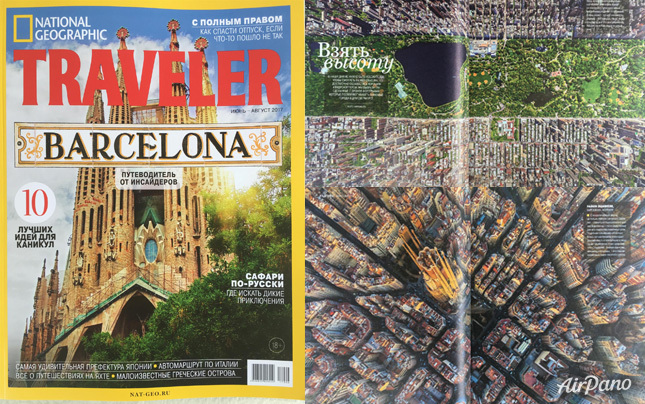 AirPano photos have been published in the National Geographic Traveler Russia. Below you can see panoramas of Dubai, New York and Barcelona, printed on the double pages. This year we have published our second book on German: Neue Weltbilder. The book includes new stories of our shooting and more beautiful photos around the World. The book is quite popular: on Amazon.de it became the Best Seller. You can check our first book on German here. 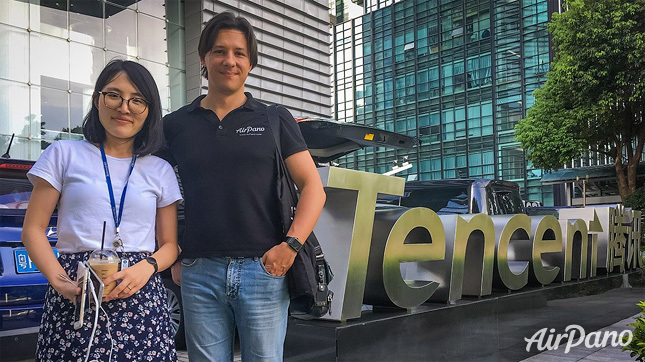 AirPano CEO Sergey Semenov has returned from China, where he met with leading representatives of such companies as Tencent, Huawei, Xiaomi, Insta360, Digital Domain, Pico VR, Varis. 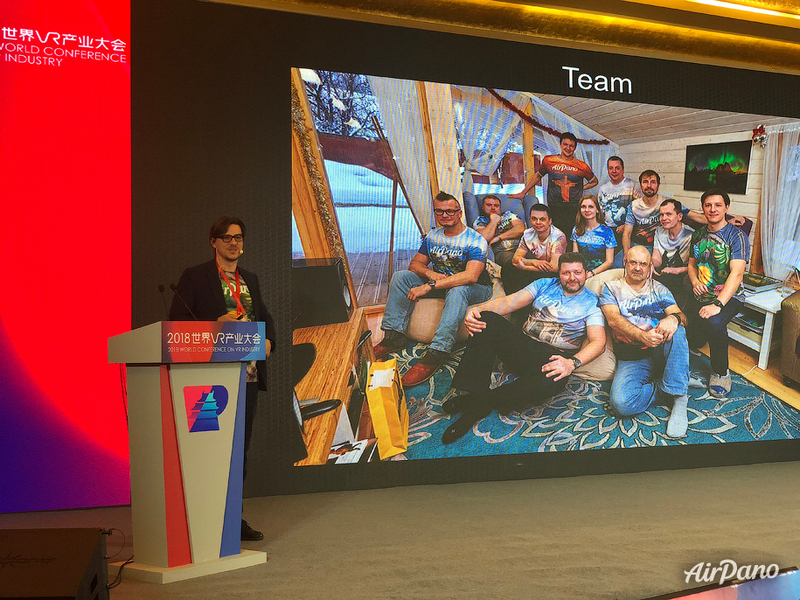 During his stay Sergey had time to visit Beijing, Shanghai, Shenzhen, Chengdu and hold several workshops. 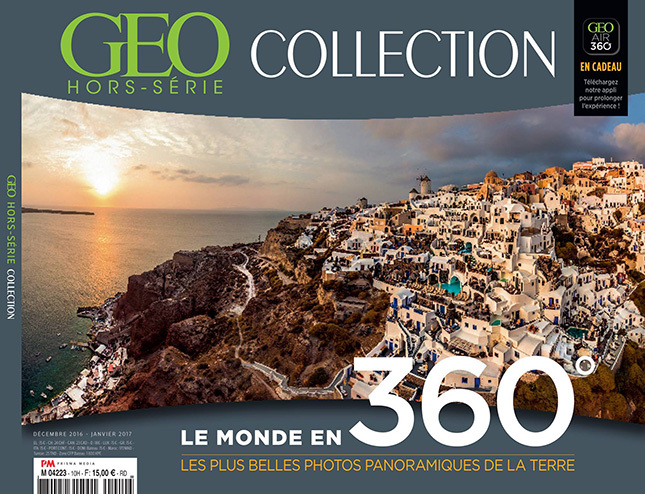 GEO France has released the second issue of the GEO Collection magazine, completely dedicated to the works of AirPano! Look for them at news-stands of France! Besides the print edition, new apps with virtual tours in 360° format have appeared in the AppStore and Google Play Store. Rose Calendars has released interactive calendars with our panoramas. There is new panorama for every month, with QR code to this panorama in 360° format. These calendars won Gold at the World Calendar Awards in the USA, the Trophy for Communicative Products at the Promotional Gift Awards held in Europe and Best Innovative Corporate Calendar at the NCA Awards in London. The results of the 35AWARDS2016 contest were announced on May 23. Congratulations to Oleg Gaponyuk who won in the nomination “Staged photo” with his “Captured by light” series and the third prize winner in the “Landscape – day” nomination Dmitry Moiseyenko with his “Lost in ice mirage” photo. The pictures “Morning on the beach” by Sergey Rumyantsev and “Nibbler” by Oleg Gaponyuk have reached the final Top-100 best photos of 2016. 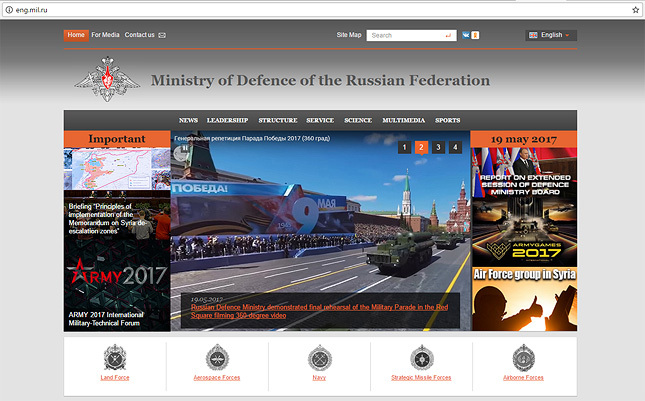 Ministry of Defence of the Russian Federation has published our 360° video of the preparation of Victory Parade in Moscow. We express our gratitude to the Department of information and mass communication of Ministry of Defenсe of the Russian Federation for the opportunity to film the preparations for the Victory Parade 2017. 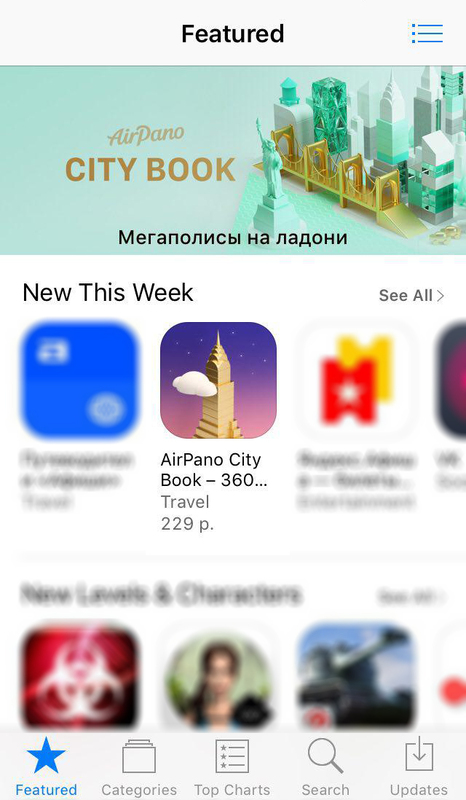 Recently we've released our new app AirPano City Book for iOS. Now the app is featured in App Store! AirPano City Book is a collection of unique spherical photo panoramas of the most amazing cities in the world shot from a bird's eye view. City Book takes you on exciting journeys through some of the most photogenic places on Earth, using virtual tours. The company's aerial panorama technology lets viewers experience soaring through the sky above the some of most beautiful cities in the world, with tours of New York, Paris, Barcelona, Dubai, Amsterdam, Singapore, Rome, Shanghai, Buenos Aires and Moscow. You can download AirPano City Book here. On April 12 the "Spiritual values of Russia. A view through time" exhibition started in the State Duma — the Parliament of Russia. AirPano photos are presented there. 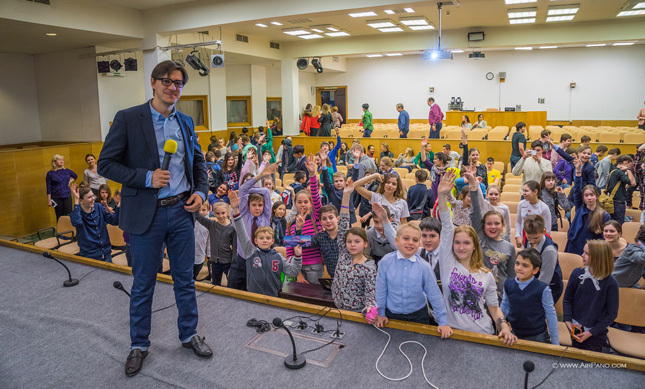 Sergey Semenov visited this wonderful event. Our panoramas of Egypt are shown in binoculars by Polden Studio at the 24th Moscow International Travel & Tourism Exhibition. It takes place on Expocentre Fairgrounds, Moscow from 14 till 16 March 2017. The 1st of March was a remarkable day — during this day our web-site received 2,73 million visitors and it was for the first time in the history of AirPano. 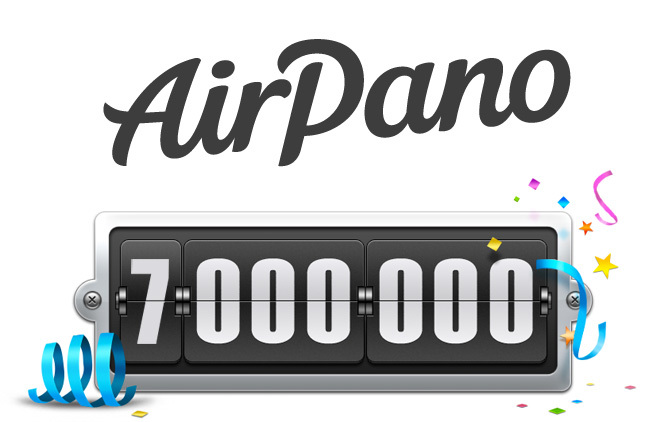 Seven million people visited our site since February 26 till March 7! 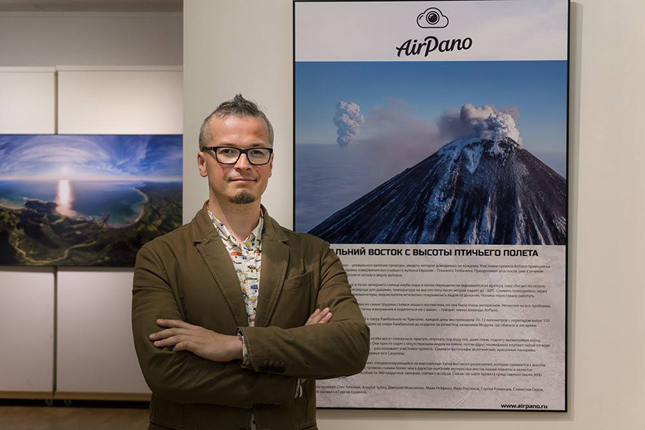 There is an exhibition called "Primordial Russia" with AirPano photos that is taking place in the Central House of Artists, Moscow from 20th January till the 11th of March. 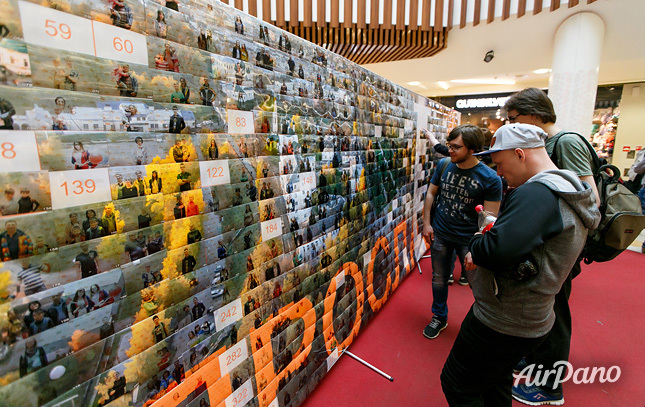 "Primordial Russia" is one of the biggest and interesting photo-festivals in Russia. It started 2014 and became an annual event and each time attracting more and more connoisseurs of Russian nature. 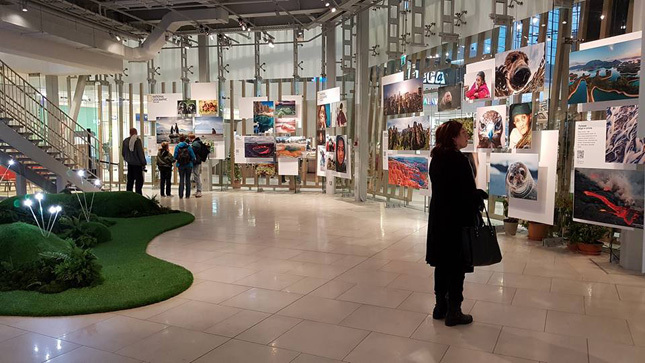 During the first month unique photos made by nature photographers are demonstrated in Moscow, then the exhibition moves to other cities and countries. From 2 till 5 February Moscow held an exhibition called "Moscow Dive Show 2017". 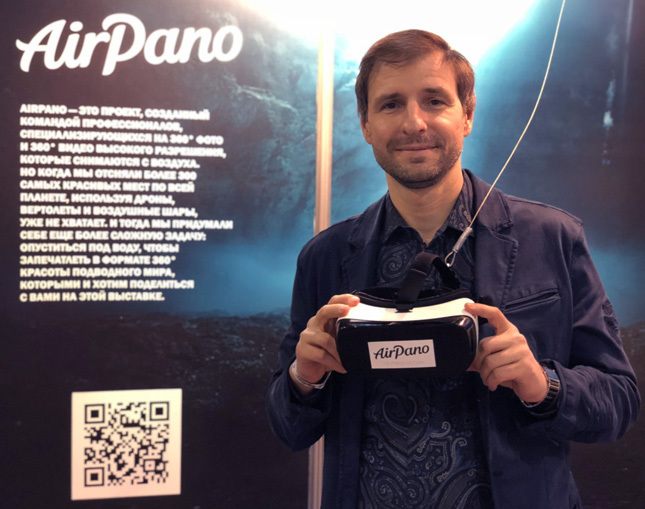 Some of the best underwater photos of the founder of AirPano project Oleg Gaponyuk and our friend Maxim Guzovsky has been presented on this exciting event. 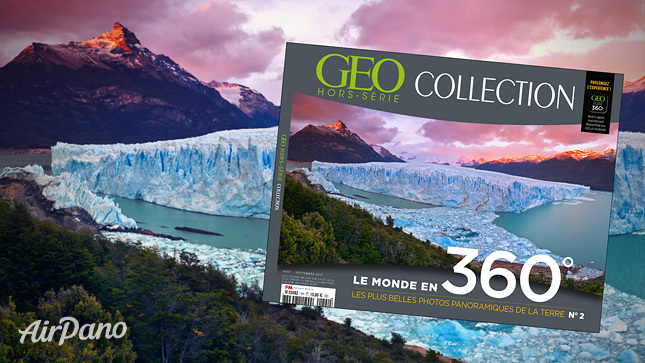 A new edition of GEO France Collection appeared yesterday at the news-stands of France. This issue is dedicated to the filming of 360° content and completely consists of AirPano photos! The magazine also released the new app in French language which you can use to watch our best photo panoramas from around the globe on your iPhones and iPads. 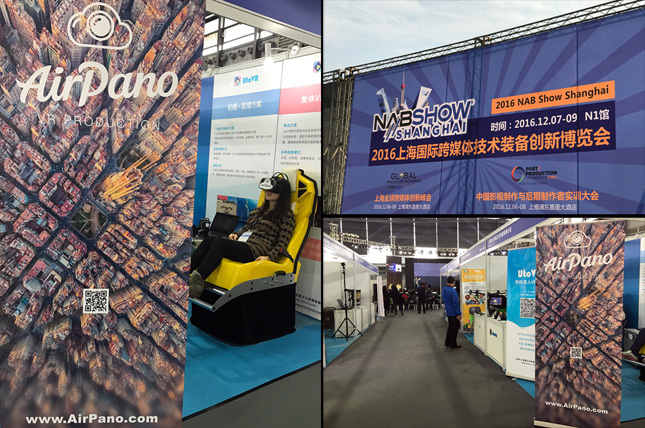 AirPano's Chinese representatives — the UtoVR company — are taking part in the NAB Show Shanghai 2016 (December 7-9). 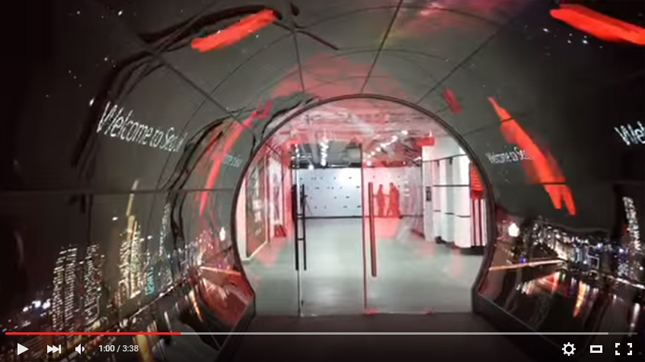 On UtoVR's stand you can see our best videos and learn about the specialties of filming 360°. 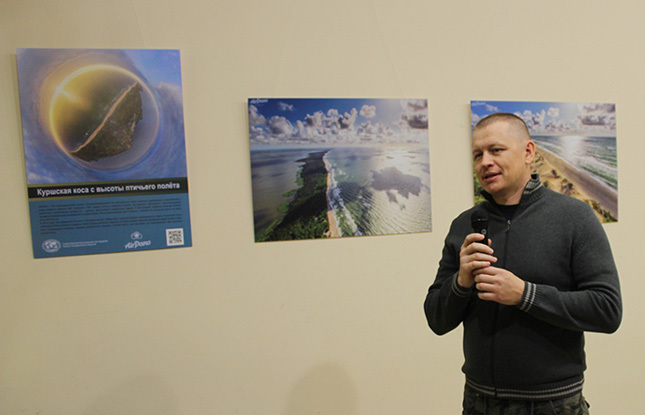 A photo exhibition with AirPano photos is taking place in the museum of the Curonian Spit National Park. We've made these photos with grant help of the Russian Geographic Society. Our IT-specialist Andrey Sudarchikov made a speech on the opening of the exhibition. 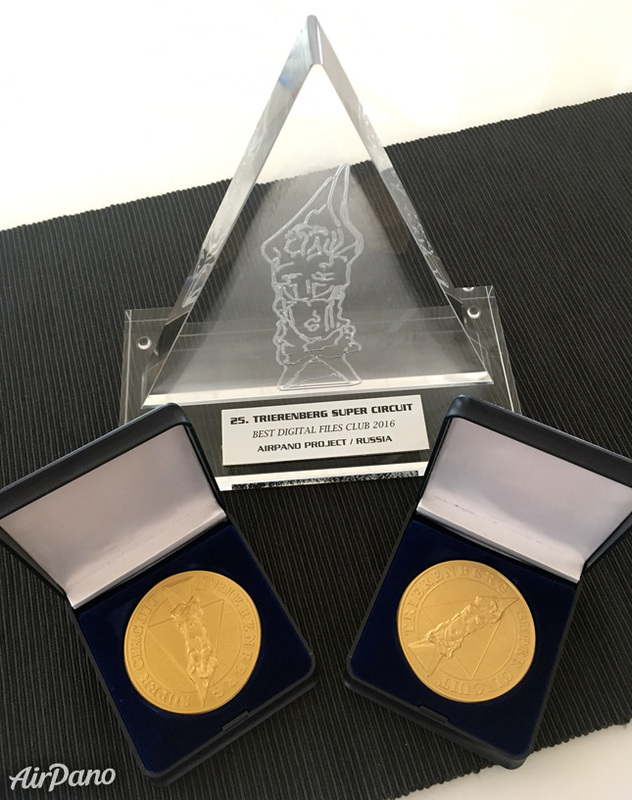 We have received our prizes for Trierenberg Super Cicruit 2016. Let us recall, that AirPano has been announced as the Best Digital Files Club on the World's Largest Photo Salon — Trierenberg Super Cicruit. 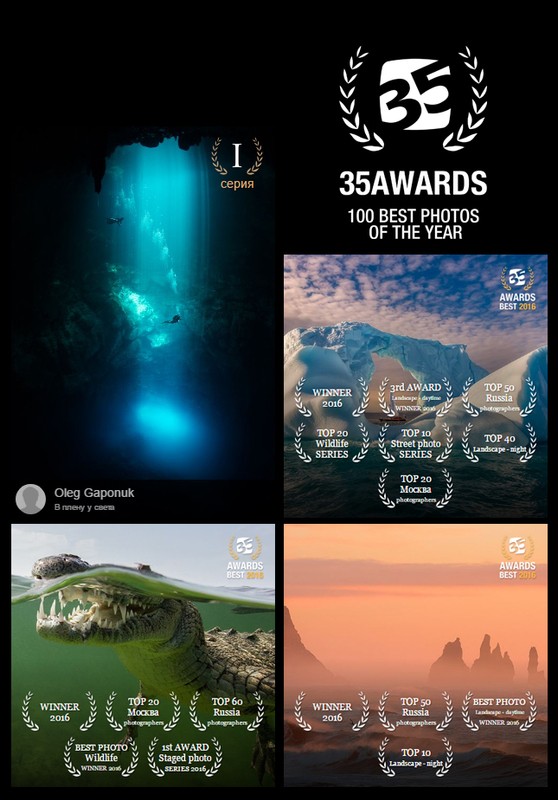 Our photographers have become winners and medalists: Sergey Rumyantsev with the image of the Northern lights in Stoksness, Iceland; Sergey Semenov with the photo from Tupiza, Bolivia; Mike Reyfman with his photo from Los Glaciares National Park, Patagonia, Argentina and Stas Sedov with the panorama of Burj Khalifa, Dubai. The winners of the most prestigious competition in panoramic photography Epson International Pano Awards have been announced. 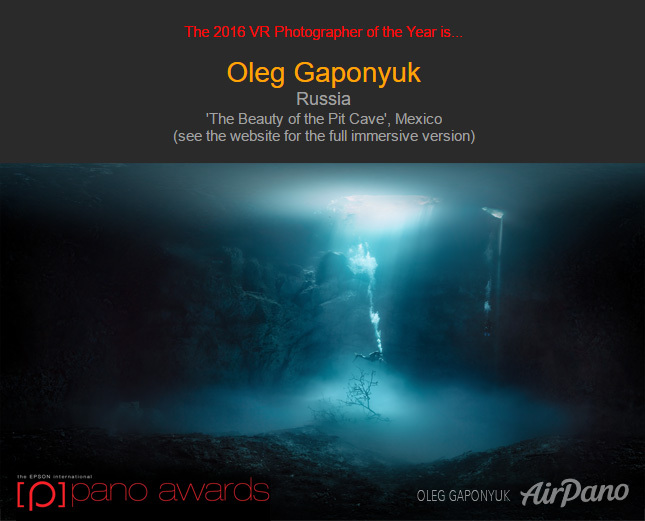 13 works of AirPano are in the Top-20 of the VR/360 category and the winner is Oleg Gaponyuk with his underwater panorama of Pit Cenote in Mexico. 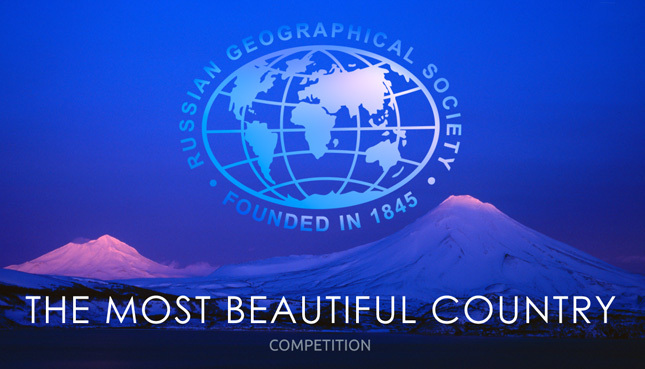 The final jury meeting of the Russian Geographical Society photo contest “The most beautiful country” took place on September 21. Sergey Semyonov was a member of the jury. Sergey Shoygu, Sergey Gorshkov, Konstantin Ernst, Oleg Tabakov, Elena Gagarina, Dashi Namdakov, Timur Bekmambetov, Ivan Kislov and Dmitry Vinogradov evaluated the works with him. 110 000 photos of Russia were presented to the contest. Winners in 12 nominations were selected and one more “Public chosen winner” nomination is put to the vote on the web-site of the contest. The winners will be awarded on September 24. The video report can be found on the First Channel web-site. We are happy that our photographers once again have become winners and finalists of the international wildlife photography contest Golden Turtle 2016. 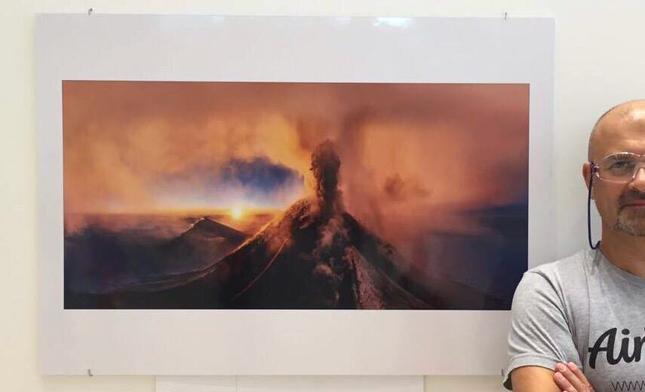 Dmitry Moiseenko — the winner of the Cup — was also presented a gift-book for his picture of a volcanic eruption in Klyuchevskaya Sopka, Kamchatka, Russia in the category "Landscape". Sergey Shandin is a finalist in the category "Animals" with his photo of the giraffe. You are invited to visit the exhibition at the Central Exhibition Hall "The Moscow Manege". It closes on August 21. 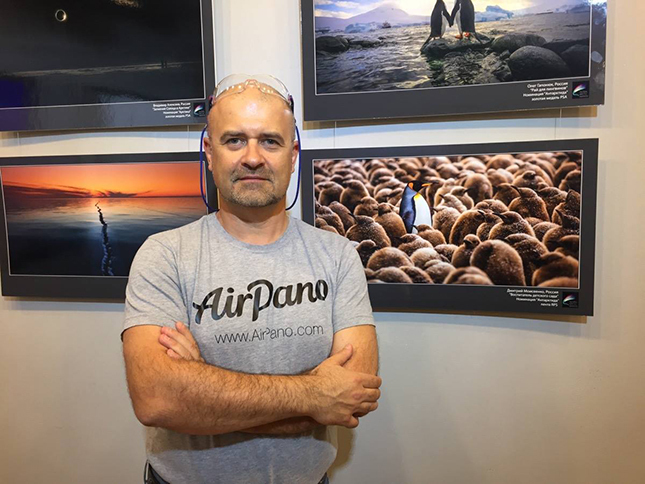 Today the CEO of ‪‎AirPano‬ Sergey Semenov participated in the opening ceremony of the Russian Geographical Society photo exhibition, which consists of works of the winners and finalists of the "The most beautiful country 2015" contest. Sergey is also the member of the jury for this contest this year. These photos can be found in the Moscow metro at the "Vystavochnaya" station and will be hanging there till August 3. On the 14th of July in the frames of Russian Photo Week‪ AirPano‬ will be giving a workshop at the Gallery of Classical Photography (Moscow) from 2:00 to 3:30 pm. Sergey Semenov is going to speak about VR, 360 technology and drones. The Russian Photo Week started yesterday, on July 7, in Moscow. In the frames of this event an exhibition of the works of winners in 35AWARDS - 100 Best Photos of 2015 is taking place. ‪AirPano‬ is amongst them. The exhibition is held at the Gallery of Classical Photography until 17 July. Come and see it for yourself! From May 3 till June 20 Moscow held an exhibition called "Orthodox temples of Russia: a view through time". AirPano photos were also presented there. The exhibition took place on the Patriarch bridge in the open sky. The exposition consisted of more than 50 feature photos made by representatives of three generations of Russian landscape photographers. On 2nd July at the Trip Secrets festival in Moscow you can watch our 360 videos from Kamtchatka on Samsung Gear VR. Entrance: free. Great news! We have launched 3 apps for Apple TV-2. Now our collection of the most beautiful parts of the world from a bird's view is available on the following applications: AirPano City, AirPano Nature и AirPano Night. Browse the App Store for them. Enjoy the view. 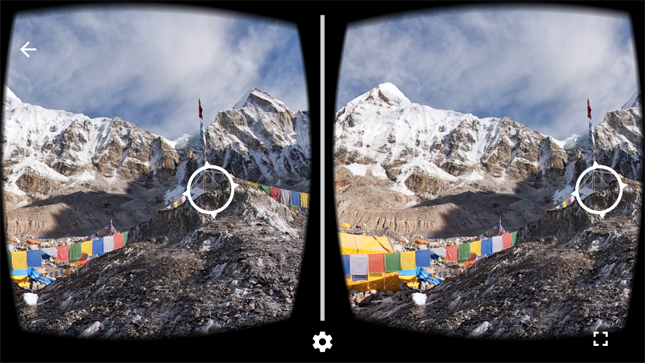 Google Expeditions — an educational program that started not long ago and already has become very popular in child institutes all over the world — has finally issued and app for Android. There you may find ‪AirPano‬ panoramas. It is very pleasant when your work useful, especially for young researchers! Soon iPad and iPhone versions will be available. A "Museum of one photo" exhibition is taking place at VDNH, Moscow. Each week the exposition is changed with a new photo. This week is represented by the ‪#‎AirPano‬ panorama in the genre of "Aerial photo shoots". Hurry up and see it before July 3. 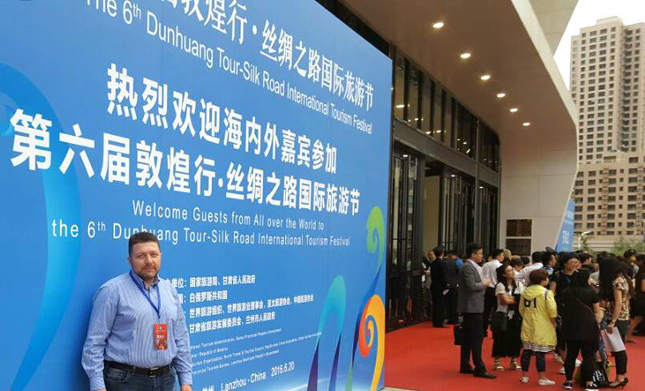 At the present Stas Sedov having been invited by the China State agency for tourism is overseeing the beauties of the Gansu province of the country. The Silk Road festival is taking place there. Gansu is one of the most gorgeous provinces in China. The Silk Road goes right through it. 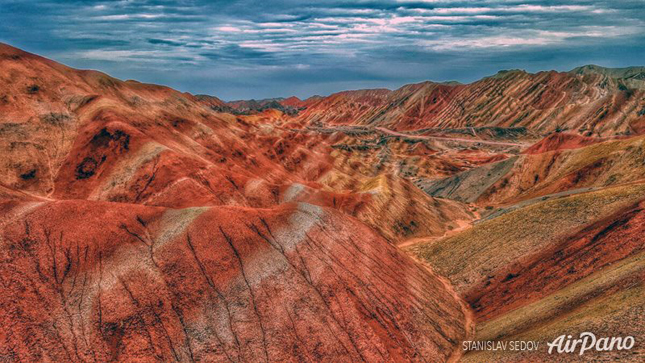 The province is famous for the Yueyaquan oasis in the desert, the ancient Jiayuguan Pass of the Great Wall, The Zhangye Danxia colored landforms. "My Chinese journey continues. Up till now I have seen herds of camels, climbed to the top of a high barchan on top of which I saw a great view. I have also experienced a sand storm that changed into a storm with sand and rain. The Sleeping Buddha in a 45-meter high cave seriously impressed me". Stas Sedov, AirPano drone operator. 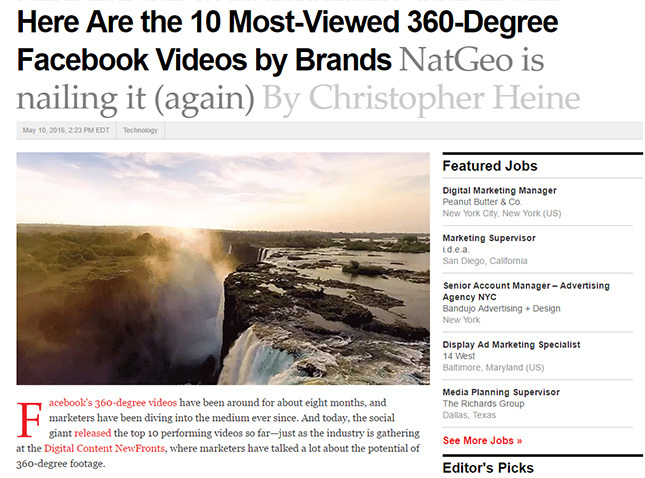 Our 360° videos are in the Top-10 of the most popular videos in this field on Facebook. National Geographic published our videos of Victoria Falls, Bears and Volcano of Kamchatka, and each of them reached more than 7 millions views. You can see the Top-10 on Business Insider and AdWeek. Hurray! We have just found out that two of our photos won second place in the AdMe Photo Awards 2016. The jury liked the photo “Westerdok” by Stas Sedov in the “Travel happiness” category and the photo “How the ferries are seen off” by Oleg Gaponuyk in the “Our smaller brothers” nomination. 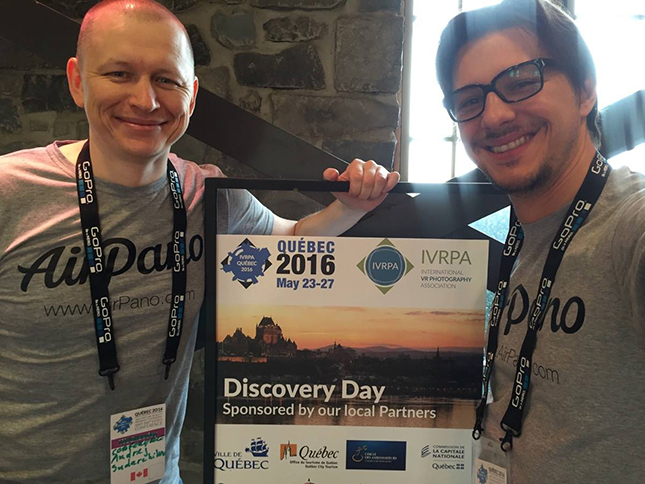 The 11th international conference Québec 2016 — IVRPA Virtual Reality Photography & 360° Video Conference is starting today. The #AirPano team is being represented by Sergey Semenov and Andrey Sudarchikov. Sergey will comment on the specifics of 360° photo and video in the wild nature. He will share with other interesting moments of the life of AirPano. While Andrey, our computer and web expert, will present the new multipurpose Vrap player and conduct three workshops on the specialties of his activities. 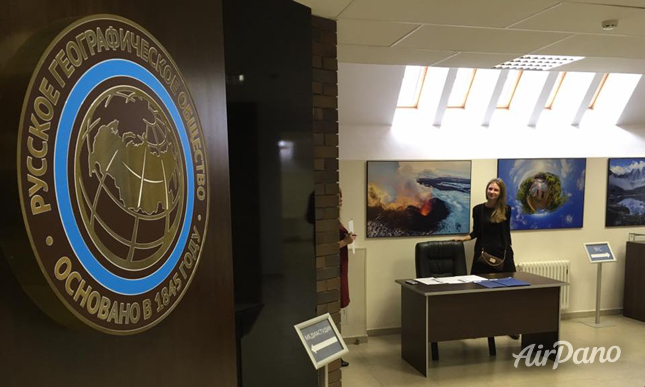 The Global Arctic Awards exhibition has opened today at the Photo Center on Gogolevsky Boulevard in Moscow. Best photos of the Arctic taken during the last two seasons by 70 photographers from 15 countries are presented there. You can also find AirPano masterpieces at this event. Here it is! 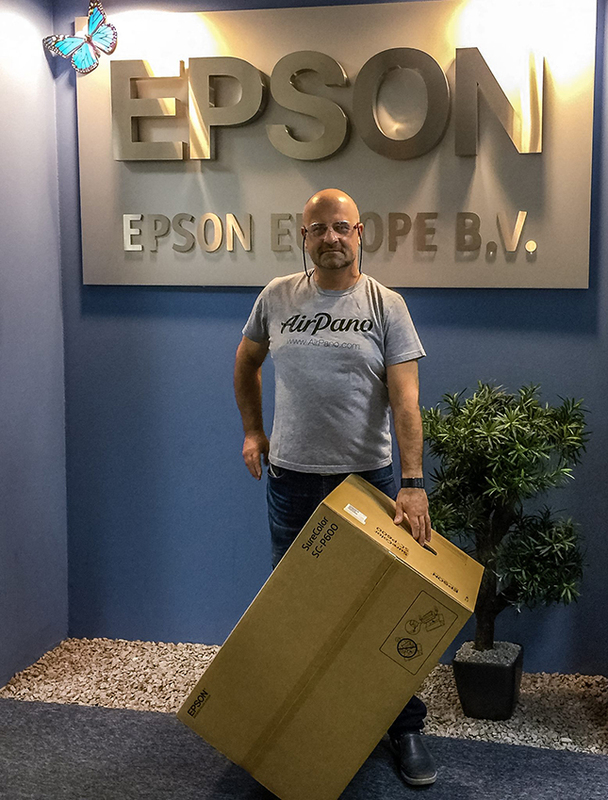 Our prize for winning The EPSON International Pano Awards. We got printer Epson SureColor SC-P600. Thank you, Epson! 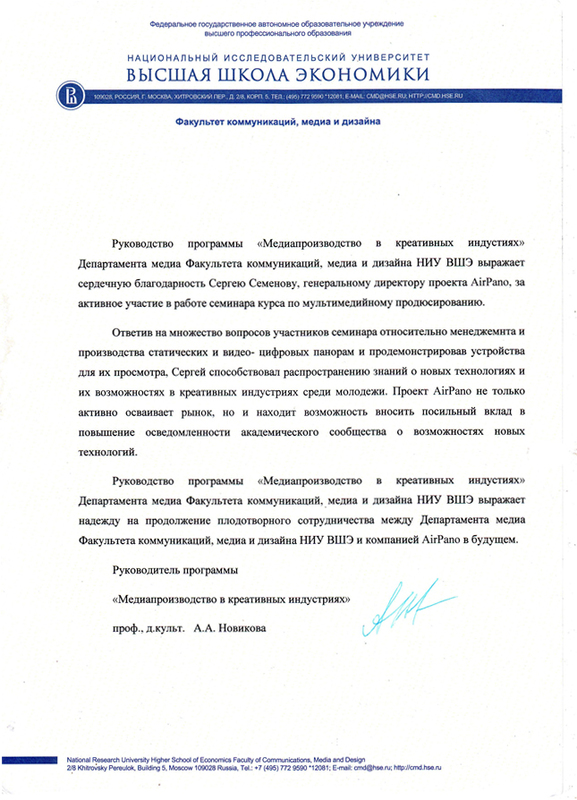 Сongratulations Dmitry Moiseenko! We paricipate in the Intermuseum festival. 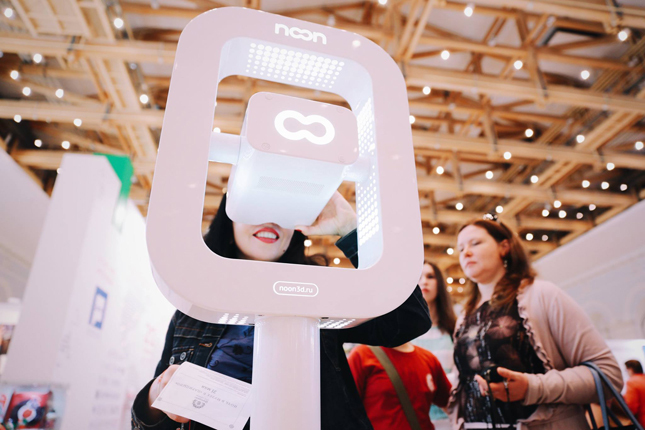 Visitors can watch our panorama through binocular by "Noon" studio. The festival is taking place in Moscow, from 13th till 16th May. 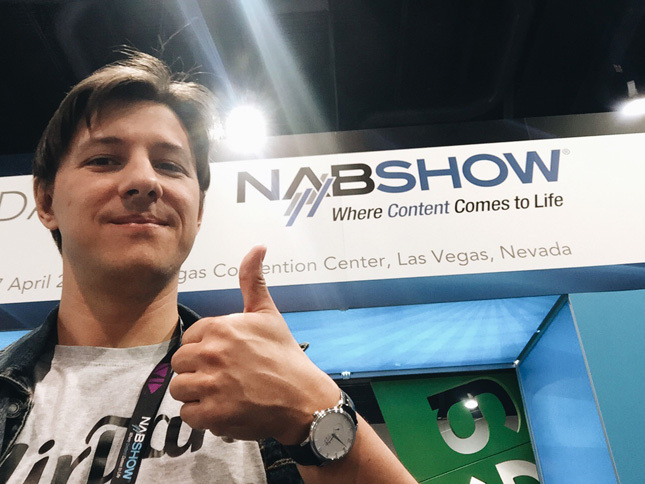 Sergey Semenov Las Vegas representing AirPano in Las Vegas, at the world's largest event NAB Show 2016 which is covering filmed entertainment and the development, management and delivery of content across all mediums. 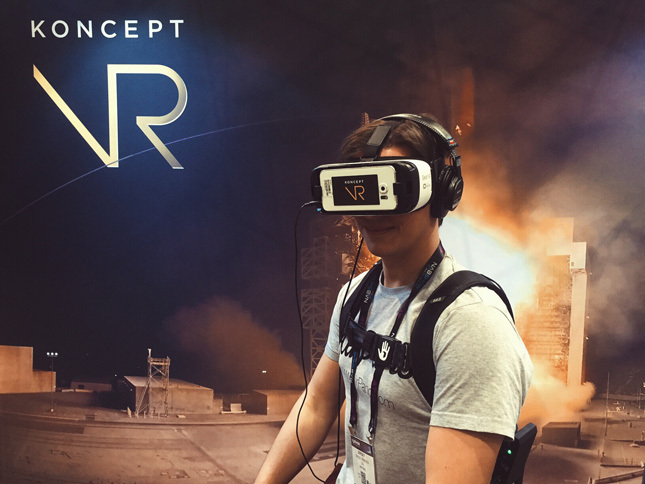 Sergey is planning to examine tendencies and novelties in the VR content world and meet members of Google, GoPro and other concerned companies. 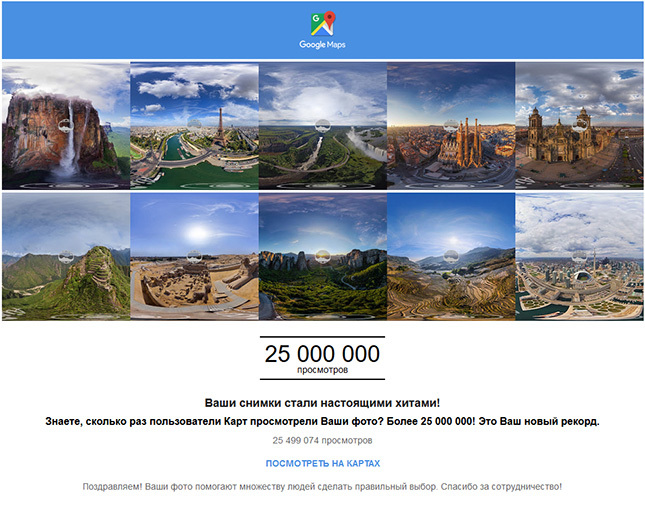 Our panoramas have been viewed more than 25 million times on Google Maps! Thank you for staying with us. 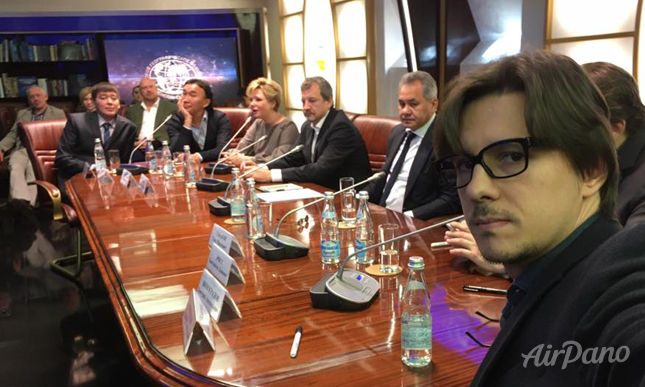 Sergey Semenov is a member of the jury in the Most Beautiful Country competition launched today by Russian Geographical Society. 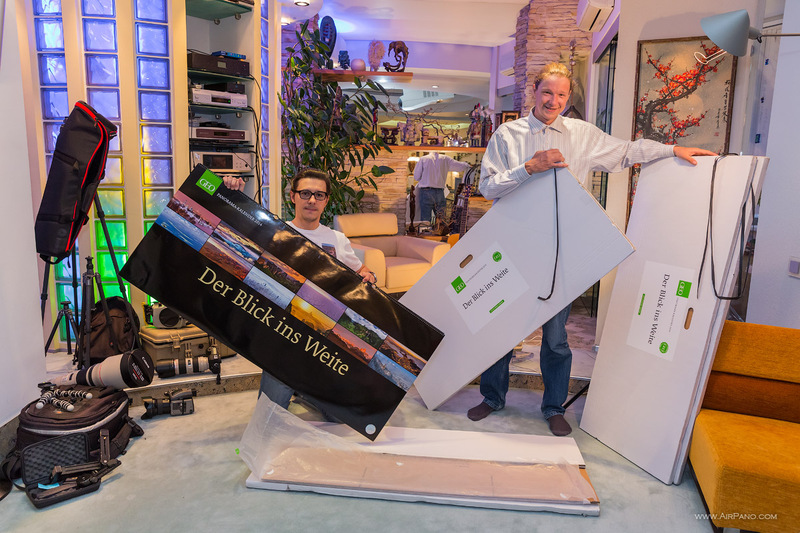 We are glad to tell you that our project AirPano has been announced as the Best Digital Files Club on the World's Largest Photo Salon — Trierenberg Super Cicruit. 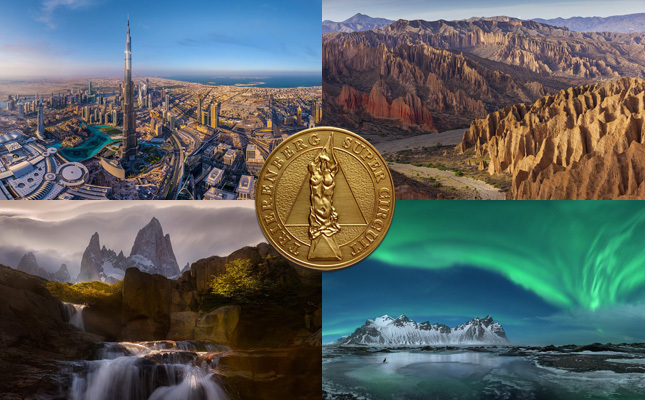 Our photographers have become winners and medalists: Sergey Rumyantsev with the image of the Northern lights in Stoksness, Iceland; Sergey Semenov with the photo from Tupiza, Bolivia; Mike Reyfman with his photo from Los Glaciares National Park, Patagonia, Argentina and Stas Sedov with the panorama of Burj Khalifa, Dubai. 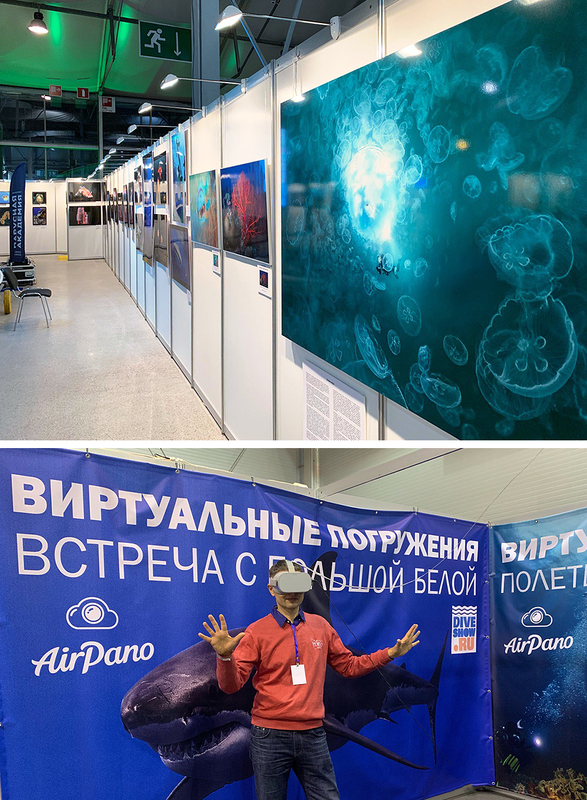 After taking part in the "Primeval Russia" festival the works of AirPano took off to the Classical photo gallery. These photos will be presented from March 23 till May 8 and on the 9th of April an audience with Sergey Shandin — one of the authors — will take place. On this account Sergey talked on the radio "Our Suburban Moscow" in the show "High time" on the 1st of April. AirPano created panoramic timelapses in resolution 36K and 42K! 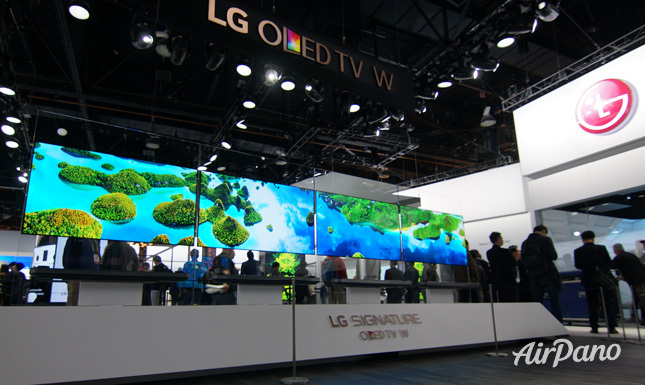 Video are shown in N Seoul Tower on the LG OLED videowalls. On January 28 Sergey Semenov the Incredible read a lecture at the High school of Economics on the subject of multimedia producing to the students of the Communications, media and design faculty. 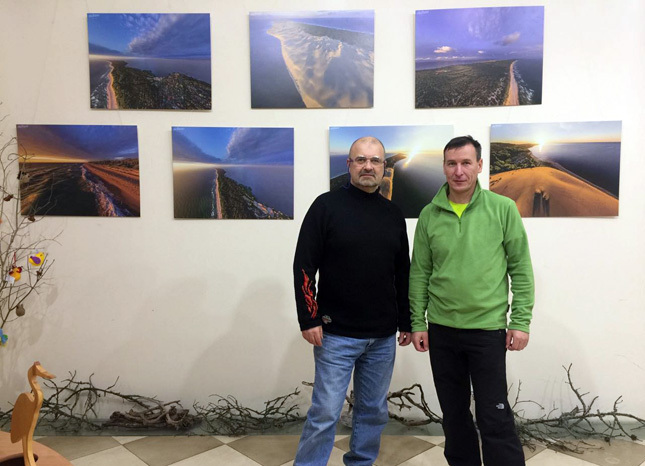 There is an exhibition called "Primordial Russia" with AirPano photos that is taking place in the Central House of Artists, Moscow from 22th January till the 25th of February. "Primordial Russia" is one of the biggest and interesting photo-festivals in Russia. It started 2014 and became an annual event and each time attracting more and more connoisseurs of Russian nature. During the first month unique photos made by nature photographers are demonstrated in Moscow, then the exhibition moves to other cities and countries. More than 2 million people have visited this festival in 70 counties in the past 2 years. More than 10 million views! Our virtual tour "New York, Manhattan, Night" has been seen more than 10 million times! During its preparation we faced several technical issues. Having overcome them we managed to create a unique night panorama that was filmed out of an open Skyscraper window. The story of the shooting is available here. The results of "The Best of Russia 2015" conquest were announced. This year 3 photos by AirPano photographers won in the "Nature" category: the Klyuchevskaya Sopka volcano by Sergey Shandin and Dmitry Moiseenko, and the Altay by Sergey Semenov. Traditionally this spring there will be an exhibition in Moscow with the best photos of the participants. 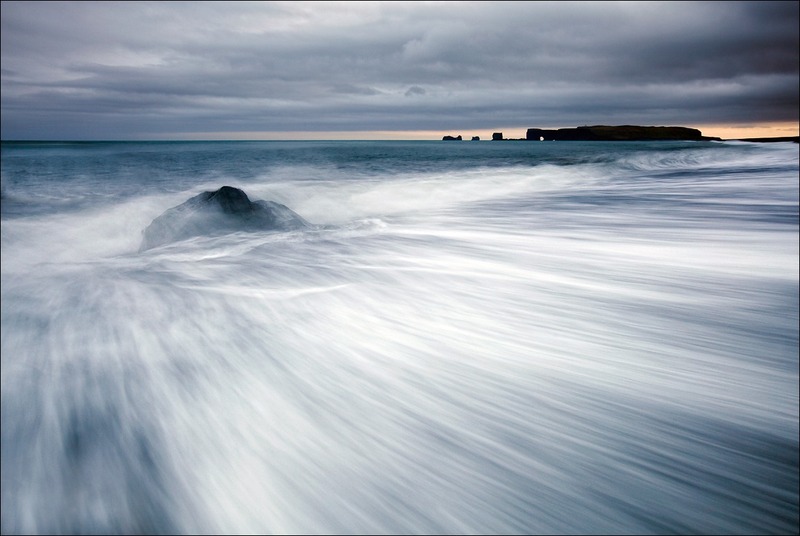 Nikon has launched a web-site showing the work of its Russian ambassadors in different genres. 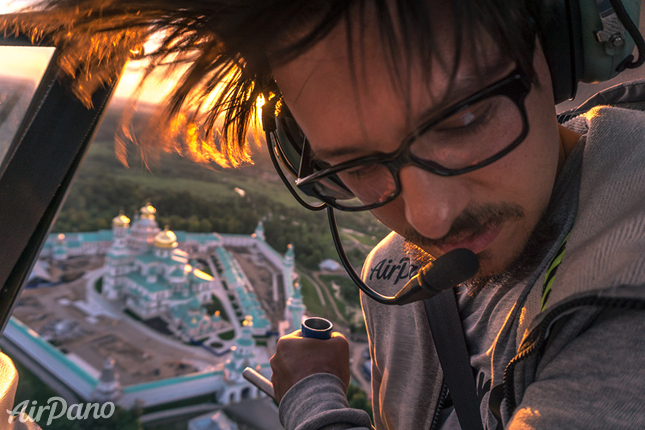 Dmitry Moiseenko, the AirPano photographer, became a Nikon ambassador in the field of aerial panoramas. In this project professionals talk about their work, photo equipment and how to operate it. They give master-classes on creation and editing of photo sessions and share the experience. 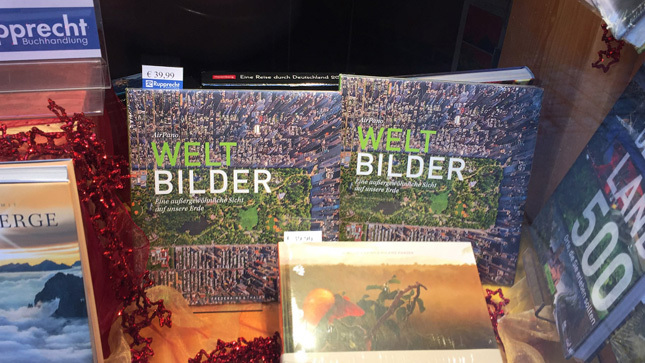 Our book "Weltbilder" is in every German bookstore! Today the results of the Epson International Pano Awards were announced. We won in a few categories! Dmitry Moiseenko took the first place in the "VR / 360 Photo" category. We also won 5 Top-10 places in this category! Photos by Sergey Semenov, Stas Sedov and Dmitry Moiseenko hit the Top 50 in the "Architecture" and "Landscape" categories among professional photographers. Dmitry Moiseenko won two prizes for the Best aerial photo and the best panoramic photo. We are participating in the International Investment Forum Sochi-2015. 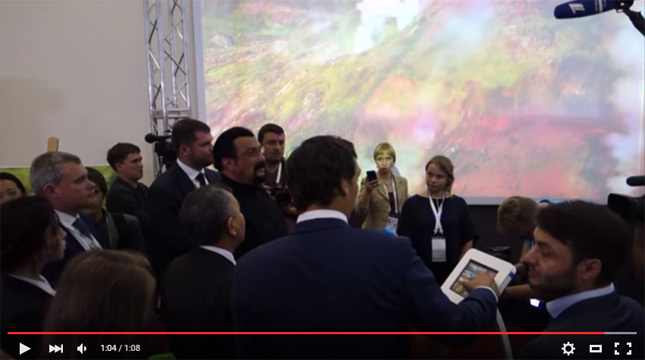 We are demonstrating unique aerial panoramas on the stand of Sakhalin Region. 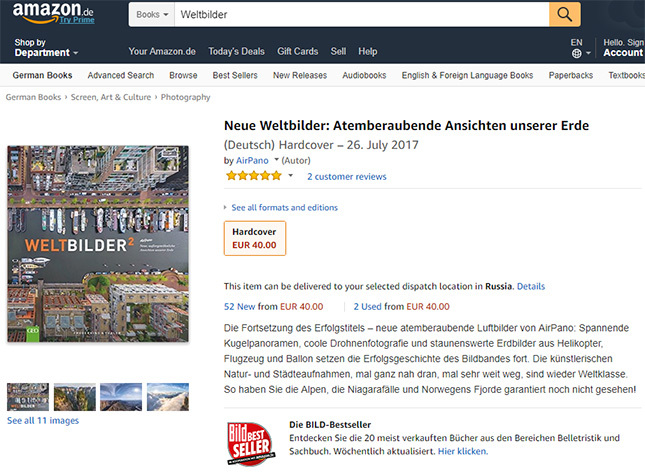 This year we have published book "Weltbilder" in Germany. It includes our best photos and storis of shoots. The book is quite popular: on Amazon.de it became the Best Seller #1 in "Picture books around the World" category. "Weltbilder" is available for order here. The Eastern Economic Forum took place in Vladivostok on 3-5 September. 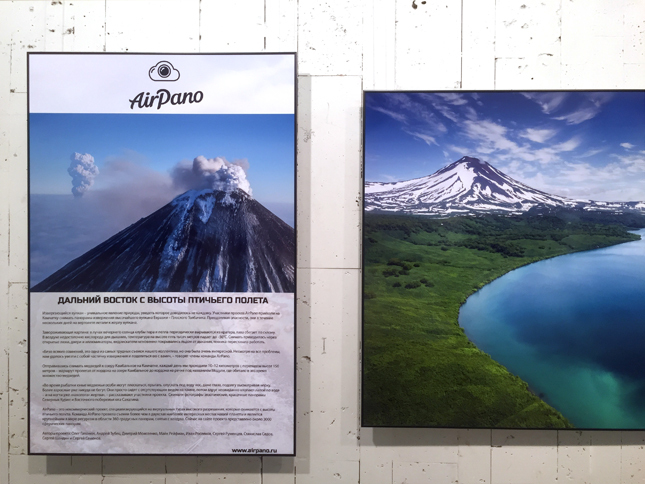 The AirPano Team presented 3 stands with panoramas of Eastern Russia. We were demonstrating our content in a new way: the monitors were surrounding the viewer, so there was a complete illusion of personal presence on the spot. 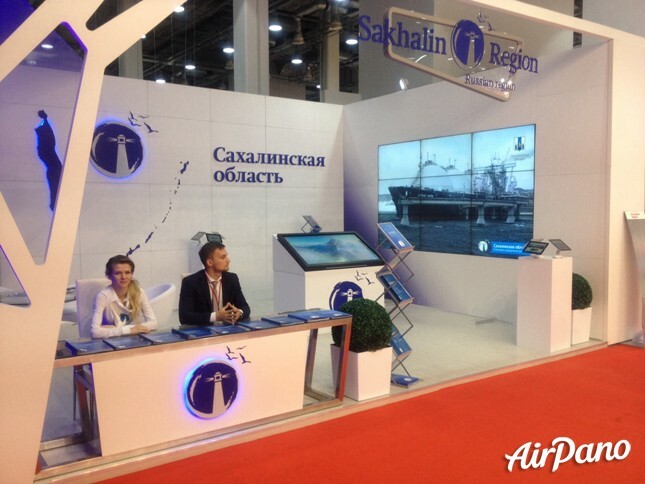 One of our stands was a combined with eight LG TV-screens instalation, where we were showing panoramas of Sakhalin. For demonstrating Kamchatka panoramas we used a touch panel and combined 3 huge projector screens. Even Hollywood star Steven Seagal was impressed with our works! GEO calendar with our panoramas is available now! 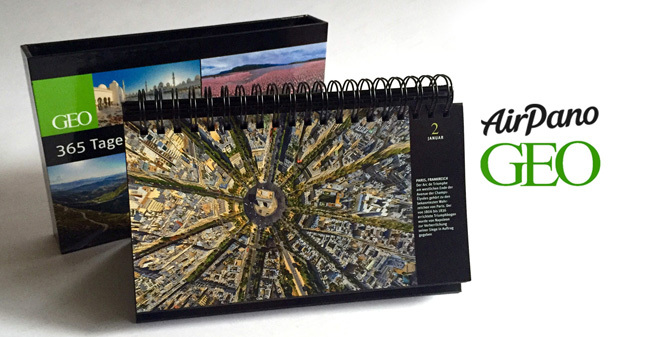 Small calendar includes 365 photos, taken by AirPano photographers. Beginning of every day is an invitation to journey to the most wonderful places around the World. Also there is available a calendar with 12 our best photos in a big format — 137x60 cm. Flawless prints, exclusive photos - this is, undoubtedly, the most beautiful calendar, which you can find for 2016 year. Our virtual tour "Waterfall around the World" has been seen more than 10 000 000 times! 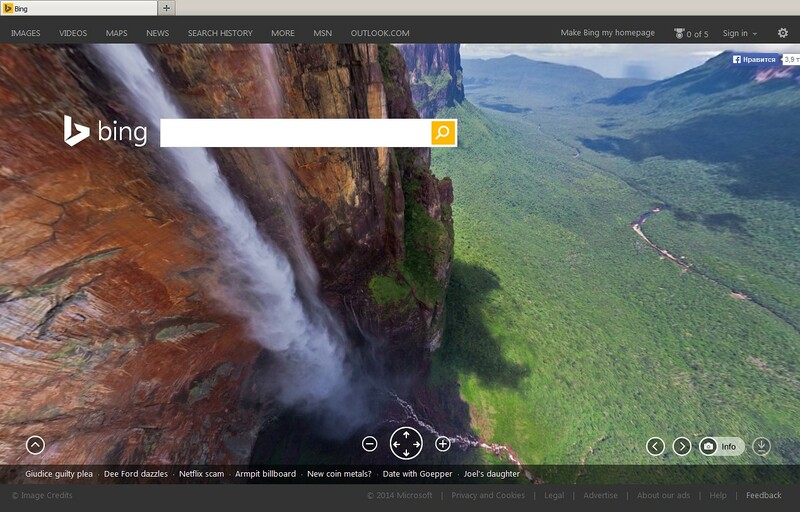 This virtual tour features panoramas of the most popular waterfalls. For example, there are panoramas of Iguazu Falls, Niagara Falls and the highest waterfall in the world — Angel. 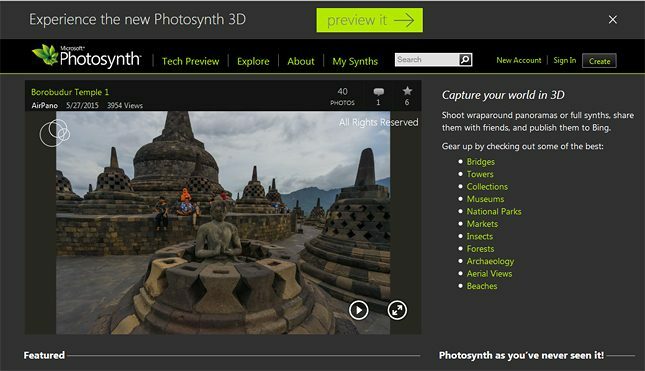 Our new Photosynth from Indonesian Borobudur Temple was featured by Microsoft! 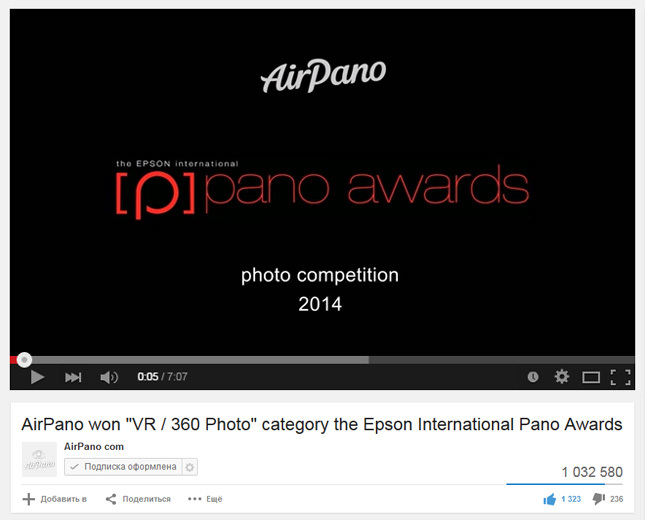 In 2014 AirPano Team again did a great job at the Epson International Pano Awards. We deicded to create a video of our panoramas, which took part in the competition. Now there are more than 1 000 000 views on YouTube! Facebook is going to support spherical video in News Feed. Mark Zuckerberg announced the new feature at F8, the company’s annual developer conference. AirPano video of Cinque Terre were used to demonstrate this feauture. 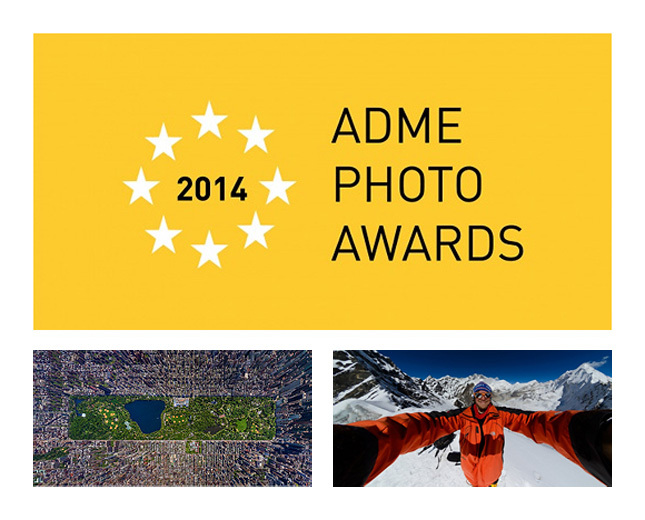 The results of AdMe Photo Awards 2014 were announced yesterday. 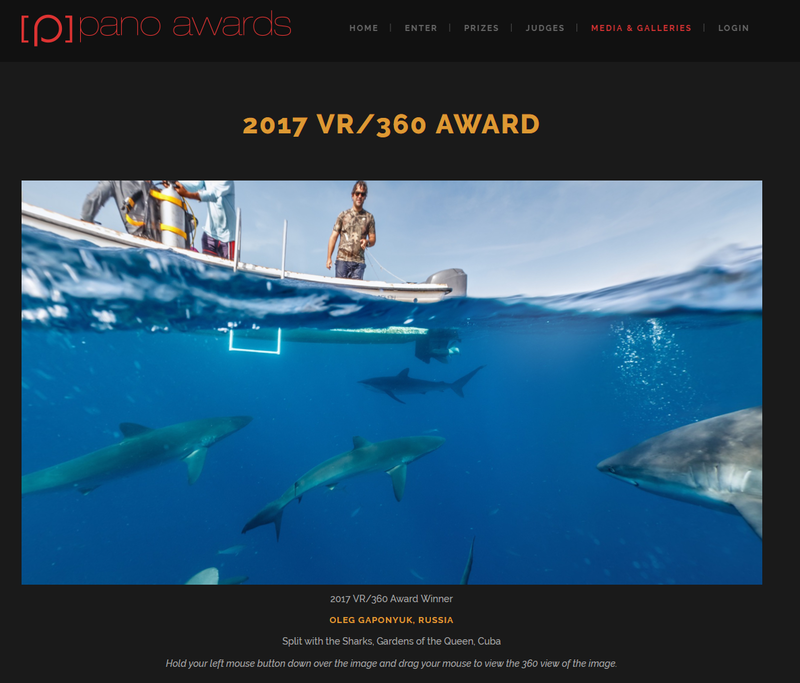 AirPano photographers won in two categories! The photo "Central Park" by Sergey Semenov took the first place in "Architecture" category. The photo by Ivan Roslyakov, "With exclusive view on Everest" took the second place in "Epic selfie" category. The opening of the AirPano Exhibition in a Moscow school #1953 took place yesterday, on 12th February. Sergey Semenov, the director of the project, spoke about panoramic photos, the process of their creation, the work of the AirPano project and the photography profession with 6th-11th grade students. They showed great interest in Sergey's speech, asked a lot of questions and took part in a small photo session. Shooting of Plosky Tolbachik volcano eruption on "The Weather Channel"
In a few days we will publish a virtual tour of Klyuchevskaya Sopka volcano eruption taking place right now in Kamchatka. Today we would like to recall once again our shooting of Plosky Tolbachik volcano eruption in 2012 and show the video about our work in Kamchatka, created by "The Weather Channel". Today the results of National Geographic Russia "Wild Nature of Russia — 2014" competition have been announced. AirPano photographers have won in several categories! The photo "Land of Bears" by Stas Sedov took the first place in "Reserved Russia" category. The photo "Beech forest" by Sergey Semenov took the second place in "Landscape" category. Some other photos by Sergey Semenov, Stas Sedov and Sergey Rumyantsev are being shown at the "Wild Nature of Russia — 2014" exhibition. Half a year ago we released AirPano Travel Book application. During this time our app was #1 in Travel category in more than 50 countries. Also, the application has been listed amongst the best apps in the AppStore. 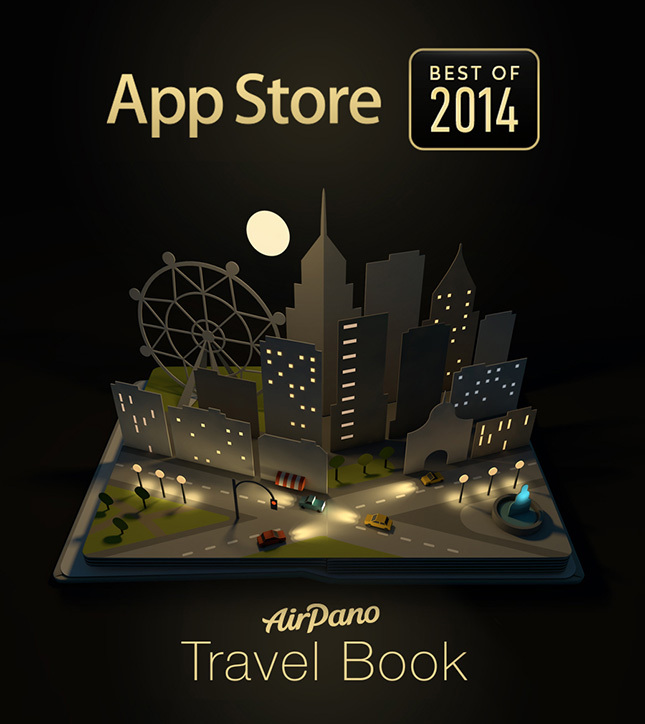 Today AirPano Travel Book is in the Apple list of the best apps of the year. We are thankful for everyone, who supported us, downloaded the app and recommended it to friends! The AirPano Travel Book application is now available on the iPhone! The first version of the app was released in the summer of 2014 and was suitable only for the iPad. Now, owners of iPhones can download this great application too. 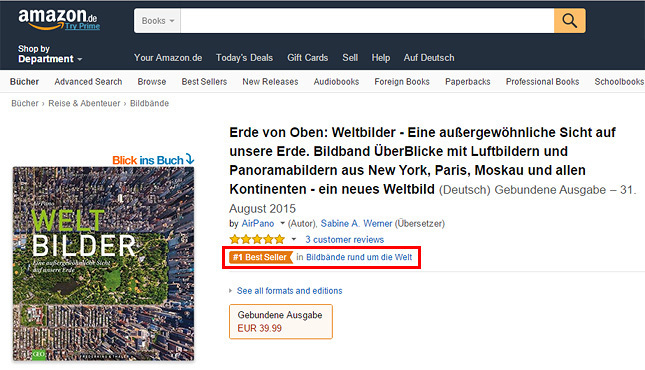 The AirPano Travel Book is #1 in the Travel category by number of downloads. Also, the application has been listed amongst the best apps in the AppStore. You can download the app here. 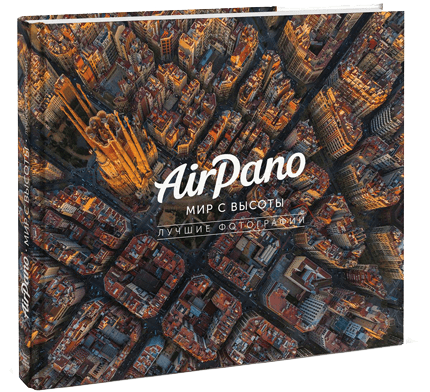 We have published the book "AirPano. Best photos of the world from above"! It is our first printed book and we keep our fingers crossed that our followers would like it as much as our virtual tours at our web-site. Size: 24x27 cm, 192 pages. We have gathered our best photos from all most interesting parts of the world. Each of them also has a particular description of the place it illustrates. AirPano Team did a great job at one of the biggest contest of Europe Trierenberg Super Circuit. 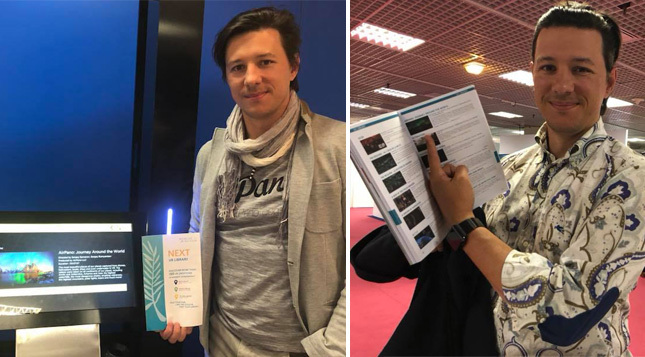 Dmitry Moiseenko and Sergey Semenov took 4 gold medals in categories: "Landscape — world travel", "Panorama" and "Architecture and sights". In September edition of the Welt der Wunder magazine AirPano photos were published. Spherical panoramas in the form of planets of 8 famous cities of the world were published in the article "Die welt von oben" ("The world from above"). In 2014 AirPano Team again did a great job at the Epson International Pano Awards. Dmitry Moiseenko took the first place in "VR / 360 Photo" category. There are 5 top places in every category. In addition to the main prize Stas Sedov and Dmitry Moiseenko took 4th and 5th awards in "VR / 360 Photo" category. A large number of works of our project also hit the Top 50. 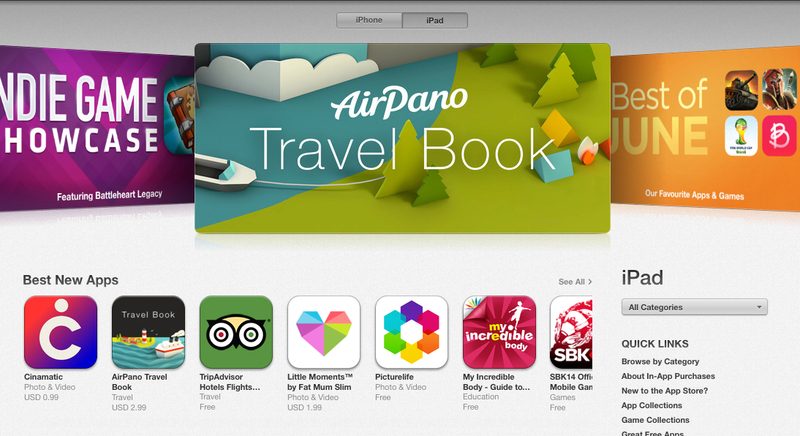 Our App 'AirPano Travel Book' is being featured as Best of July on the App Store in UK and some other countries. Check it out here. FWA is an industry recognised award program, established in 2000, showcasing projects which use cutting edge technology, together with inspirational ideas, that lead the way for future generations. We are pleased to announce that AirPano Travel Book has received the FWA Mobile Of The Day (MOTD) Award for 18th August 2014. We have released new iPad application AirPano Travel Book in June 2014. 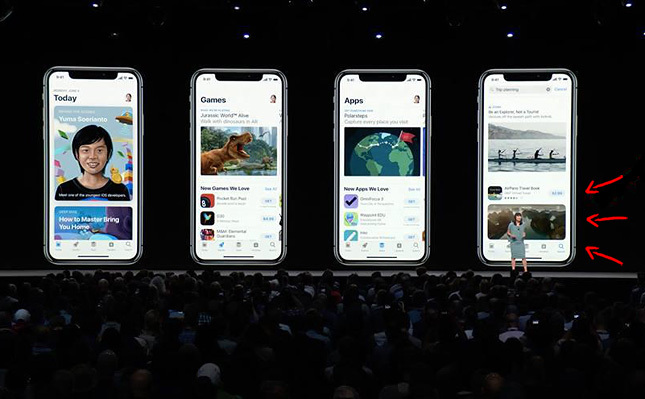 It was a pleasant surprise, that application has got into the list of best new apps in AppStore immediately after the release. Moreover, Apple placed banners of our iPad application in AppStore in 118 countries of the world. Apple also posted about AirPano Travel Book in Twitter. Festival of Wild Nature "Golden Turtle"
Exhibition of photocontest "Golden Turtle" moved from St.Petersburg to Moscow. This year 3 photos by Dmitry Moiseenko and 1 photo by Mike Reyfman became winners and finalists of the contest. 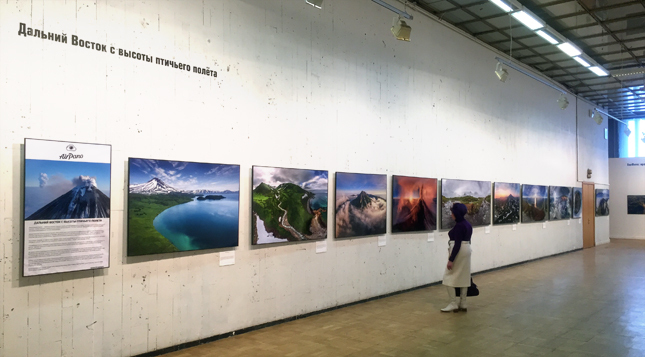 Exhibition presents 200 of the best photos of participants from 77 countries, including photos by AirPano project. Festival of Wild Nature "Golden Turtle" will be in the Central House of Artists from 28th June till 20th July. AirPano Project presents to your attention iPad application AirPano Travel Book. It contains the best spherical photo panoramas, created by our team in recent years. You can get more information about AirPano Travel Book here. Recently AirPano begins cooperation with TV channel "My Planet". Worth noting, that "My Planet" is the main Russian educational channel about travel, science and history. Now you can see our virtual tours and read our articles on Russian on their website. Photographers of AirPano project teach to make a beautiful photo, shoot panoramas, landscapes, city scenes and portraits. There are also video tutorials about usage tripod, photo filters, flash, about necessary photo accessories and about shooting in difficult weather conditions. Sergey Semenov, Sergey Rumyantsev and Dmitry Moiseenko give useful tips on shooting and demonstrate their use. Video tutorials are available on Russian here. 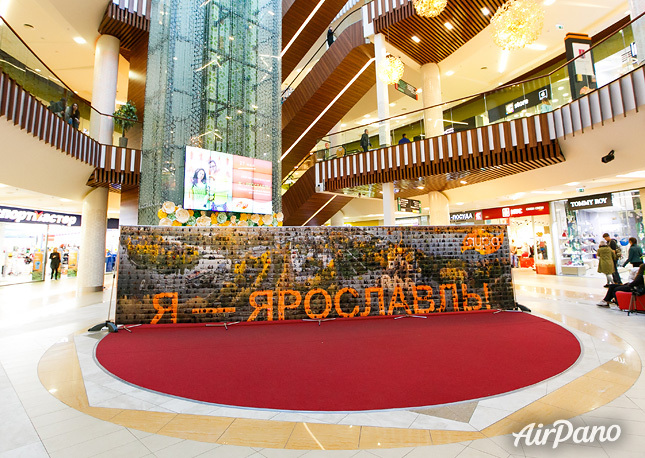 AirPano took part in CubeArt exhibition in Moscow. The exhibition will feature a unique kind of modern art made by CubeWorksStudio and panoramas made by AirPano. Exhibition will be in the Center of Design "ArtPlay" from 30th May till 30th July. There will be the 8th "Long Night of Museums" in Moscow on saturday, 17th May. Panoramas of AirPano project will be broadcast on the wall of Center of Design "Artplay" from 11 p.m. 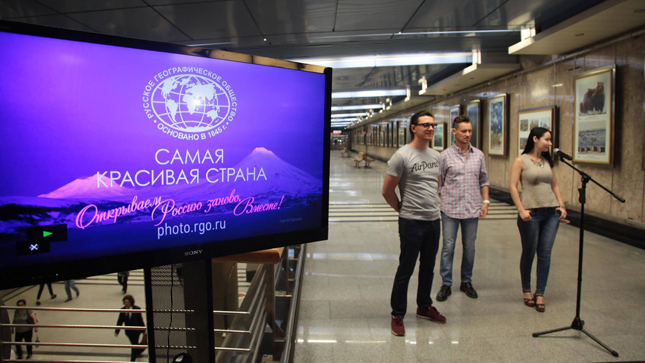 Videos based on spherical panoramas by Airpano are being shown in the largest airports of Russia. Project started in Sochi, Irkutsk and Chelyabinsk on the 1th May. Full launch of the project in all Russian airports is planned for 19th May. 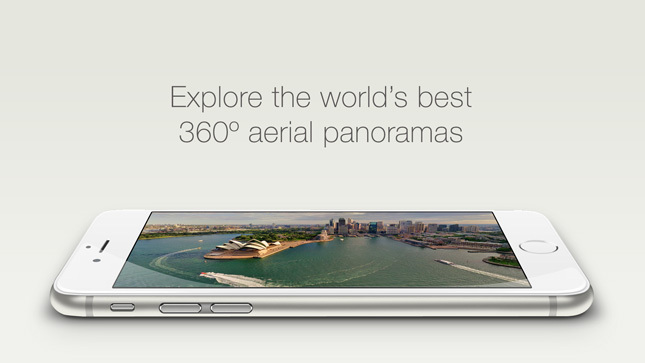 There is an application with AirPano panoramas in the Russian Samsung Apps store. 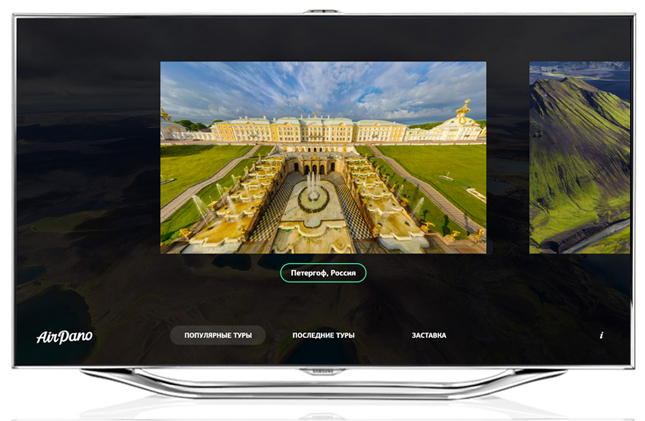 Now it is possible to watch our panoramas via Samsung Smart TV. There is a function in the application to use AirPano panoramas as a screensaver for Samsung Smart TV. Application is available in the Russian Samsung Apps store for free. 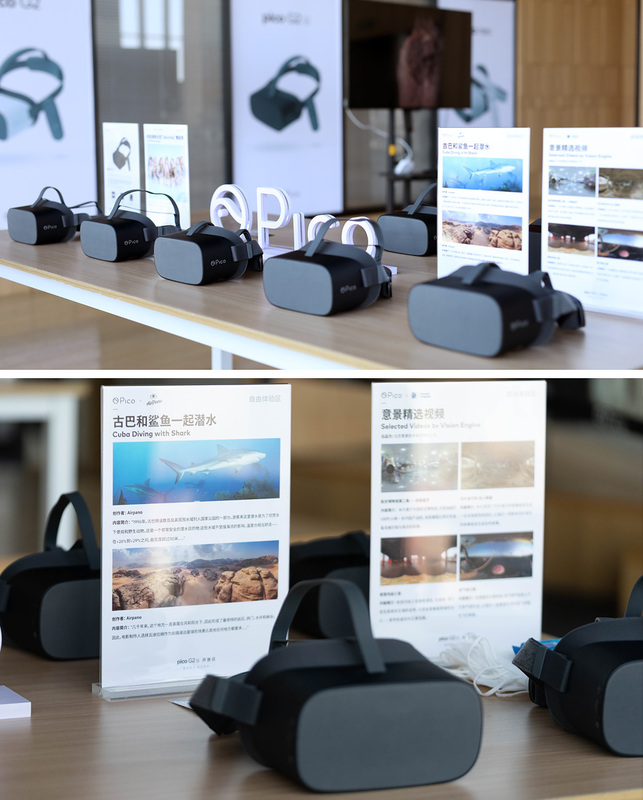 As a result of our partnership with Microsoft, Bing search engine got the opportunity to show spherical panoramas by AirPano on the Bing homepage. Every day on Bing page appears new photo, but now there is also possible to demonstrate spherical panoramas. Results of the photocontest "Golden Turtle"
On 28th Februaty was a ceremony of announcement of results of the 8th photocontest "Golden Turtle". Photo "Awakening of the volcano", which was taken by Dmitry Moiseenko for AirPano project, is one of the laureates in the category "Landscape". We also congratulate Dmitry Moiseenko on the fact that another his photo "As yet... ugly penguin" is a laureate in the category "Portrait of an animal". Photo "Bryce Canyon" by Mike Reyfman, who made this photo also for AirPano project, was in the final of the contest. 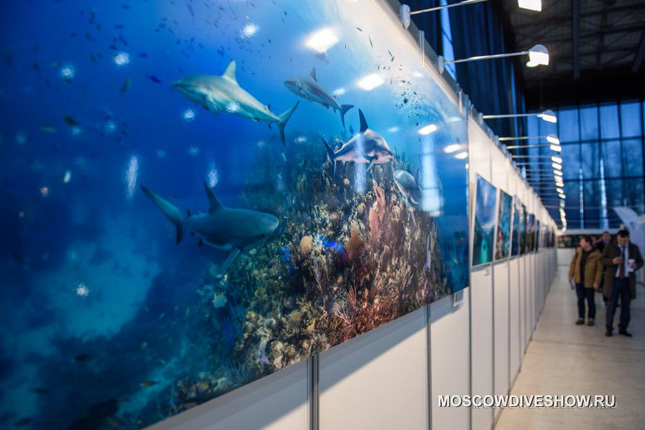 The best photos of the competition are in the exhibition in St. Petersburg, Russia. Exhibition presents 160 of the best photos selected from 15,000 submitted to the contest from 59 countries. The exhibition will be in St. Petersburg from 1st March till 18th May. This exhibition will be in Moscow from 27th June till 20th July. On Saturday, 8th February, AirPano team held a master class "Spherical panoramas. Foundation of shooting, stitching and retouching". Dmitry Moiseenko and Ivan Roslyakov told about the basics of shooting spherical panoramas and panoramas preparation for the demonstration. There is a video of this master class in Russian, on YouTube. There is Sretensky theological seminary in Moscow — an institution of Russian Orthodox Church, that studies and prepares Orthodox priests. It is located at the Sretensky Monastery. Our panorama «Church of the Intercession of the Holy Virgin on the Nerl River, Russia» is printed in very big size (shorter side is two meters long). 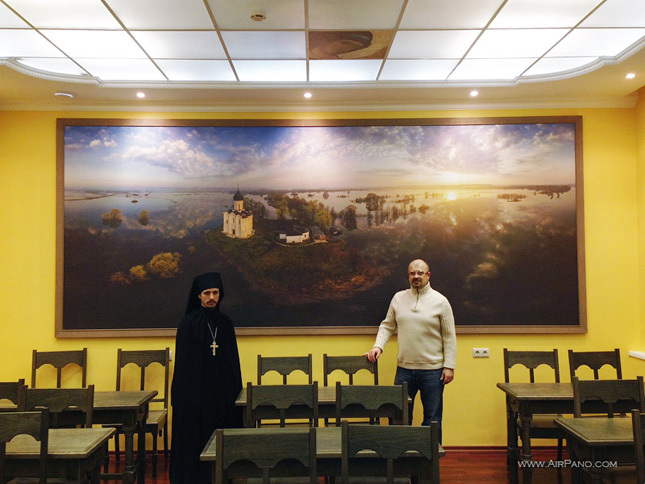 This panorama decorates one of the walls at the classroom of «Holy Russia». There is an exhibition of the international photofestival «100 Wonders of the World» in St.Petersburg, Russia. There are photos of AirPano photographers Sergey Semenov and Dmitry Moiseenko. The exhibition is open from 1th January till 2nd March. There will be an exhibition «Primordial Russia» in the Central House of Artists, Moscow from 25th January till 23th February. There will be shown more than 200 unique photos. There is no human, no industrial landscapes in this exhibition — there is only nature, animal world and unrepeatable landscapes of all Russian regions. There will be 13 bird's eye view photos by AirPano, including photos from lake Baikal and Kamchatka. Our photos, which will be in the exhibition, you can see in the gallery. 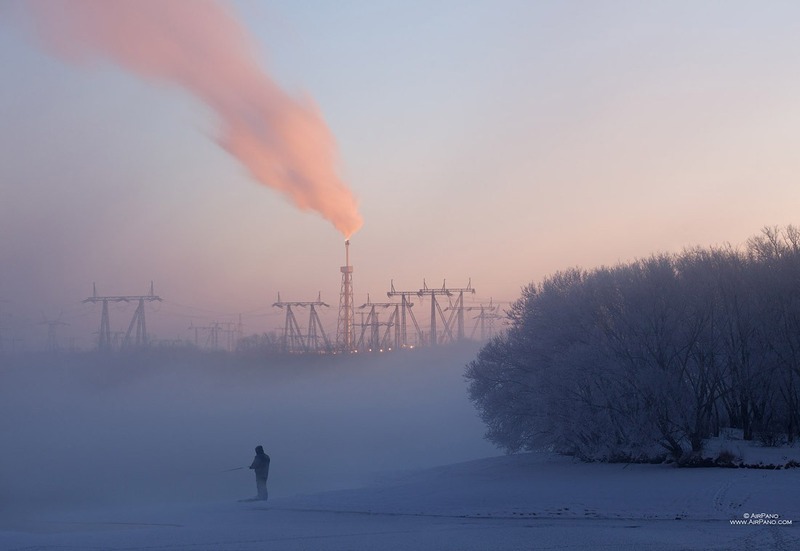 In the beginning of January the results of the one of the most important Russian photocompetitions — The Best of Russia 2013 — were announced. This year 2 photos of AirPano project are in the list of winners in «Architecture» category. In April 2014, in Moscow, in the WINZAVOD Centre for Contemporery Art will open an exhibition with photos, which won in the competition. On 17th December the Metro newspaper published an article about our virtual tour over the Moscow, Russia. «Grand tour of Moscow, Russia» includes 107 aerial panoramas. FYI: the Metro newspaper is the most read daily newspaper in Russia. On Monday, 16th of December, we published virtual tour, which have been shooting over the most famous sights of Moscow. Also we created a brief summary «Moscow, the best», which contains 22 panoramas of the most interesting places of the city. For today «Grand tour of Moscow, Russia» is our largest project, it includes 107 aerial panoramas. There was no similar shooting in the history of Moscow. «Russia-1» TV channel published a video reportage about the «Grand tour of Moscow». 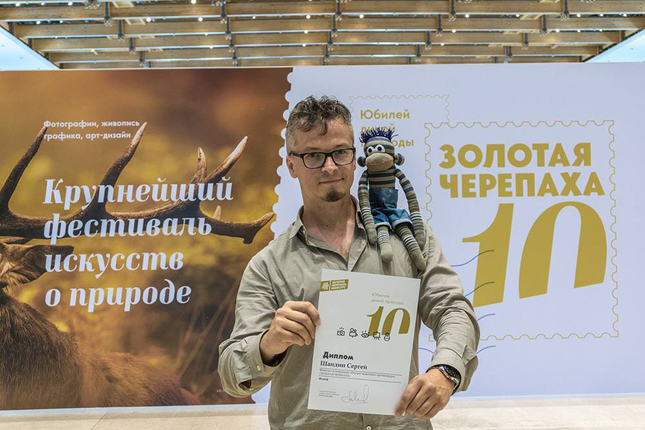 In a warm and friendly atmosphere our photographer Dmitry Moiseenko was awarded for winning the Epson International Pano Awards 2013. 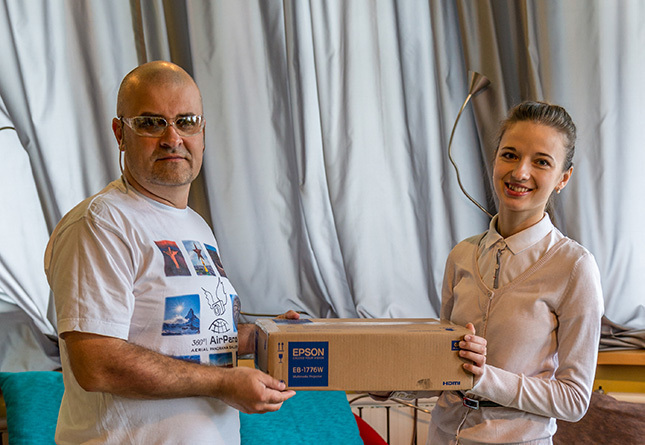 Irina Gorshonkova, representative Epson office in Russia, gave projector to Dmitry Moiseenko. We have won the prizes for the total amount of 8 000 $, but most of them are still on the way. You can view the top VR/360 video slideshow presentation here. GEO published large panoramic calendar «Der Blick ins Weite» for 2014 («Gazing into the Distance» in free translation from German). This calendar contains only photos taken by AirPano (authors of the photos are O. Gaponyuk, D. Moiseenko, S. Rumyantsev, S. Semenov). When author's copies came from a custom house, we found out that 10 calendars weight nothing less than 70 kilograms. German puctuality is amazing: calendar complect includes set of details for fastening on a wall and even a rope. Note: calendar is printed in German. 4th Epson International Pano Awards 2013 http://www.thepanoawards.com/ ended with impressive results for AirPano team. 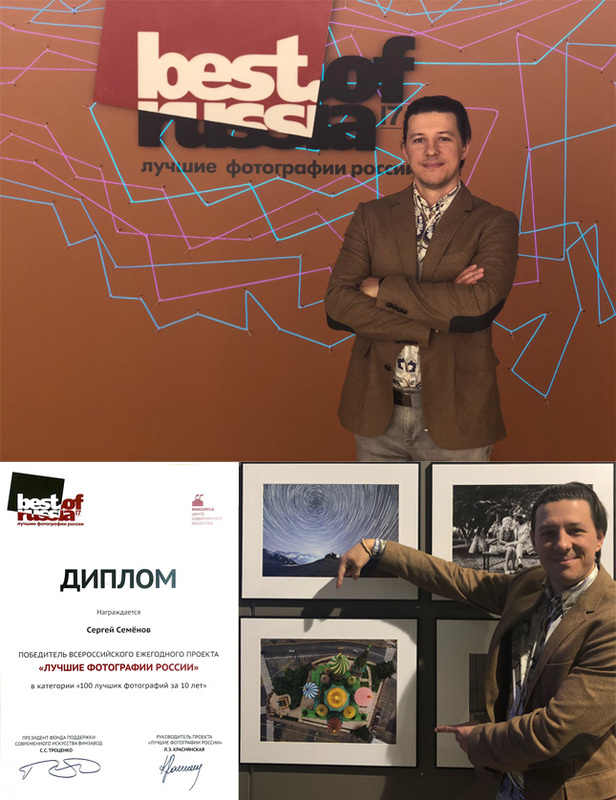 Dmitry Moiseenko was first in "VR / 360 Photo" category, he also won 1st and 3rd places in "Architecture" category for professional photographers. Top 10 of the Best of Show contains 7 photographs from AirPano: 1st, 2nd, 3rd, 4th, 5th, 7th and 10th places. Moreover, Best 50 Spherical Panoramas of 2013 include 24 panoramic pictures taken by AirPano team! You can view the top VR/360 video slideshow presentation here. It is worth mentioning that Sergey Semenov took the first prize of the competition in 2012, and Oleg Gaponyuk was named the panoramic photographer of the year in 2011. At the end of August VGTRK (RUSSIA TV channel) crew filmed a story about AirPano shooting aerial spherical panoramas of Kremlin. On Saturday, September 7th the story was featured in "Saturday News" on Russia-1 channel. Also on September 7th "RIA Novosty" website published an article and a video story about AirPano project and the virtual tour above Kremlin dedicated to Moscow City Day. 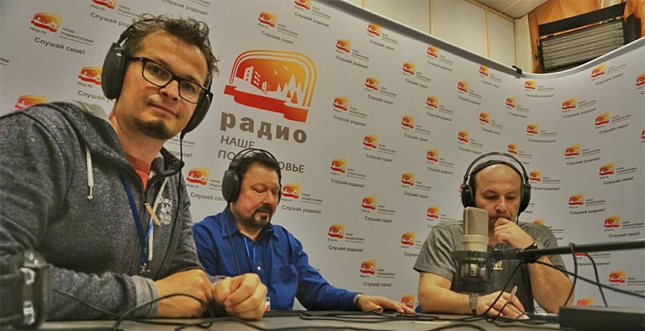 "EchoNet", a daily show on a biggest Moscow radio station focused on interesting and useful web resources, talked about our project in June 2013. "AirPano (traveling online)" article is available on their website. This year display of extraordinary award-winning images of Nature's Best Photography Windland Smith Rice International Awards 2012 opens at the Smithsonian's National Museum of Natural History. Our colleague Mike Reyfman is a winner in a landscapes category with the work "Seljalandsfoss Waterfall, Seljalands, Iceland". The annual Windland Smith Rice International Awards program become one of the most highly-respected and visually compelling nature photography competitions in the world. Approximately 25,000 entries are received and judged this year in the Awards competition. Here you can see all winning works. In April edition of the National Geographic Russia Magazine (N4, 2013), the article "International Panorama" about AirPano project was published. There was a publication about AirPano project in the March issue of Digital SLR Photography magazine. 11th of January 2013 Google Analitycs counter showed 512 283 visits to our website. It's the first time when we have the half of million visits for one day. Our photographer Ivan Roslyakov went up to 7100 meters (23294 feet) in a helicopter. This is an absolute record for rescue helicopters in Nepal. In order to make the flight, a pilot even sacrificed Ivan's oxygen tank. 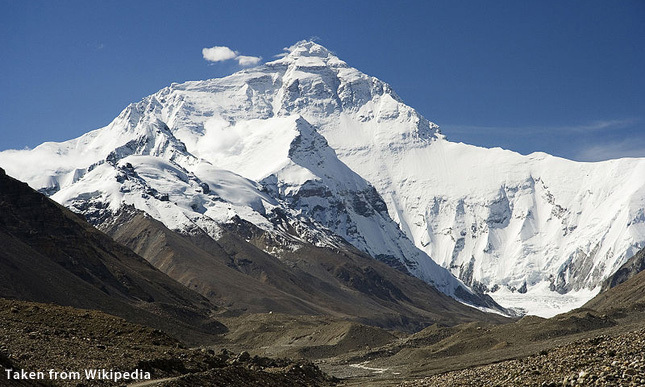 Despite the life-threatening conditions, the photographer managed to shoot several aerial panoramas of Mount Everest from unique angles. 7 million views in one year! The laureates of people choice award of Runet 2012 were announced on the 21st of November during their official award ceremony. The projects AirPano, Yarmarka Masterov, This is Horosho and Warface were awarded 4 kilogram statues covered with gold. Thank you so much to everyone who was voting for us during the November 2012! Mike Reyfman's panorama of Bryce Canyon, made under AirPano project, was published on exclusive insert of National Geographic Russia special issue - Best Photos of 2012. Our congrats! At the end of September AirPano team finished a huge project. We completed aerial photographs of hotels located on the shoreline of Antalya, Turkey. Within a month of a fieldwork we accomplished the task that seemed impossible two years ago: we took aerial photographs of over 300 hotels. In addition to that we created spherical aerial panoramas of 188 of them! In the nearest future Russian tourists will have an opportunity to choose their vacation destination by looking at hotels from unconventional angles on the website of one of the larges Russian travel agencies. Sergey Semenov will bring a talk about the AirPano project on the Cologne 2012 IVRPA Conference in Germany. You can read details about conference here. 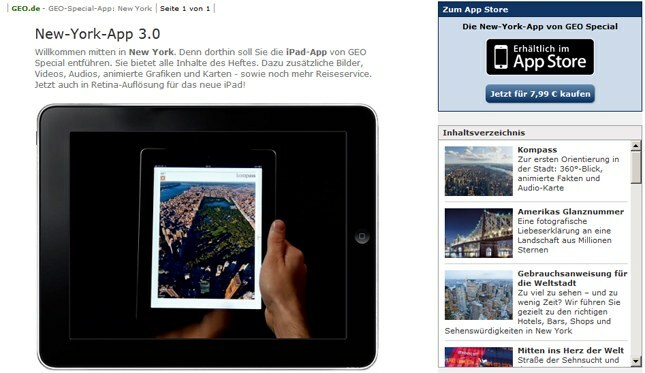 German GEO magazine launched a new iPad application dedicated to New York City. 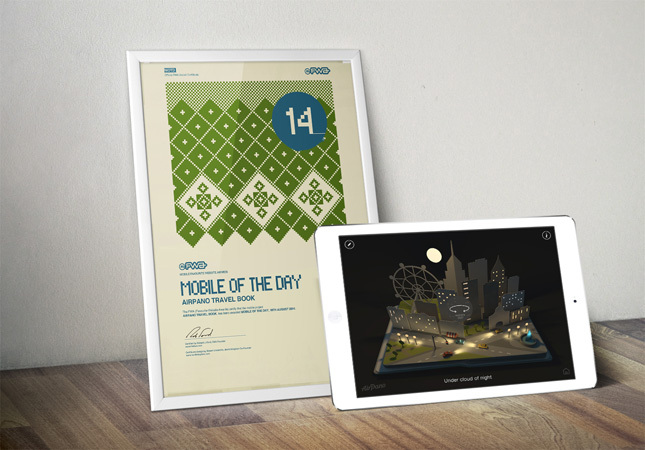 The application features our spherical panorama of Manhattan shot back in 2007. Our colleague Andrey Ershov reached the North Pole with the arctic expedition on board of "50 Let Pobedy" (50th Anniversary of Victory), the most powerful ice breaker ship in the world. Of course, he photographed it, and so from now there is a North Pole on the AirPano's map. Virtual tour of the trip will be ready within 2 months. With the help of our colleague Denis Netwind Efremov AirPano conquered the near space by reaching the stratosphere.This was an amazing adventure. Although we are still going through the footage, it is obvious that we managed to create a spherical panorama of the Earth from a height of 30 kilometers. 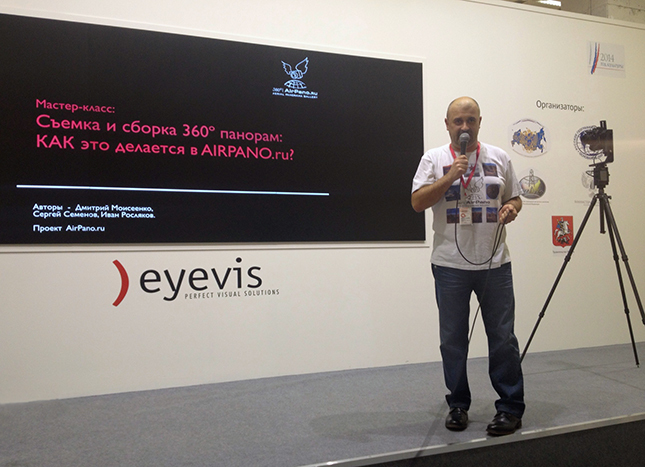 Today, on June 13, Sergey Semenov talked about the AirPano project at NYC2012 - the International Panoramic Photography Conference. 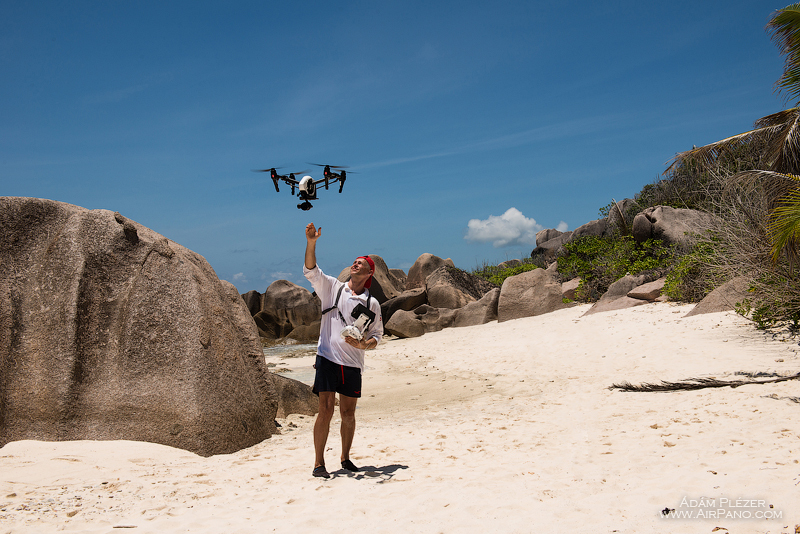 Our team is currently flying all over the world's wonders shooting airborne panoramas. AirPano is a noncommercial project focused on high resolution 3D aerial panoramas creation. Our mission is to show the beauty of the world from the air to all people in a way they never seen before. Sergey told about our recent achivements: we have made aerial virtual tours over the most famous wonders, landmarks and cities from different places around the world: Pyramids of Egypt, Machu Picchu, Christ the Redeemer, Iguassu Falls, Victoria Falls, Easter Island, Grand Canyon, Kremlin, Angel Falls, Yellowstone, New York, Dubai, Neuschwanstein Castle, Sydney Opera House, San Francisco Bay, Hong Kong Harbor etc. totaling more than 500 panoramas around 100 places shot from helicopters, light jets, dirigibles, air balloons and radio-controlled helicopter models. Triumph in the Contest "Epson International Pano Awards 2012"
AirPano took part in the international contest of panoramic photography Epson International Pano Awards 2011 http://www.thepanoawards.com/. 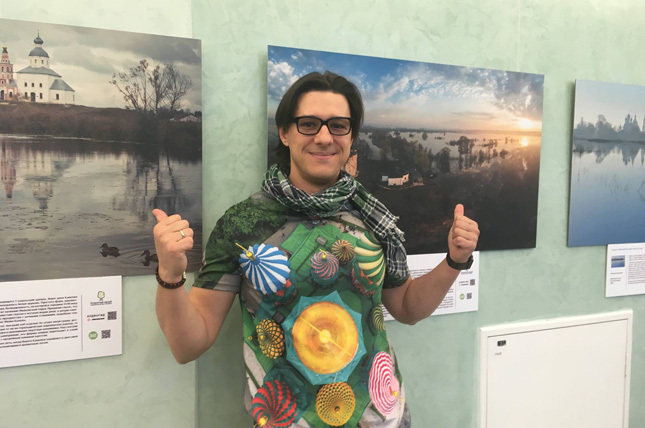 Sergey Semenov took the first prizes in category Architecture as well as the second and the third prizes in category Spherical Panoramas with the total award amount about $8500. Besides, Sergey took the contest's Grand Prix and became a honorary title of Major Amateur Winner. Last year Oleg Gaponyuk became a title of Major Open Winner and AirPano team took 1-st, 2-nd and 3-rd places in different categories. Sergey Rumyantsev won a gold medal in the biggest European photography award TRIERENBERG SUPER CIRCUIT 2012. His work "For real fisherman minus thirty is not a big deal" was selected in the section "Natural Enviroment". In January edition of the Photo&Technic Magazine (N1 (41), 2012), Photo school section, the article about AirPano project along with a feature story by Sergey Semenov were published. His feature story is dedicated to the planet stitching methods from plain projections of spherical panoramas in Photoshop. The open-air exhibition on Tverskoy Boulevard will take place from April 23, 2011 till June 30, 2011. AirPano team participants Oleg Gaponyuk, Mike Reyfman and Sergey Semenov will take part in this event. Here you can see the reportage from the first year exhibition and here see the reportage from the year 2011 exhibition. For the first time in the past 15 years, the Taj Mahal has been shot from the air by the AirPano crew! The Taj Mahal holds one of the most important places in the list of "The New 7 Wonders of the World". Despite its Muslim origin, this white marble Necropolis has actually become a symbol of India. Serious safety measures are taken in order to preserve it. The 500 meters area around the complex is equipped to serve as a special protection zone. Cars have to park 2 kilometers away from the entrance so the tourists can get there with rickshaws, carts or electric vehicles, as it is believed that the exhaust gases can make the marble cladding go yellow. Even on the other side of the river Yamuna, on the banks of which it is located, the area is protected with a barbed wire fence. Security guards' numbers are in their hundreds. In 1997, the famous Frenchman Bertrand took a picture of the Taj Mahal from a helicopter. For 15 years after that there was no permission granted to shoot the monument from above. But AirPano has managed to achieve the impossible: we have received this permission, and at this moment our photographers Dmitry Moiseenko and Stanislav Sedov are on their way back to Moscow with the footage. A virtual tour of the photo-shoot will appear on the website in May. 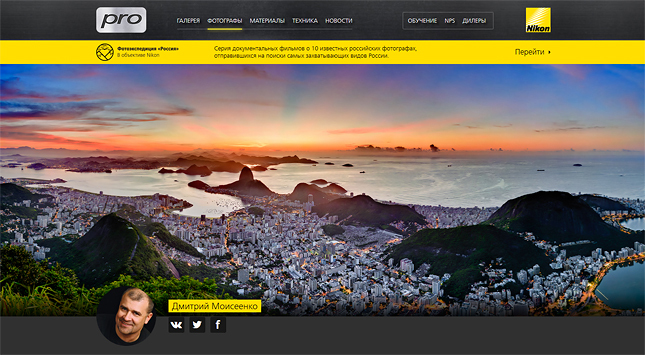 AirPano.ru became the subject to the reportage shown in news program Vesti, Russia-2 TV channel. The heroes of the reportage are Sergey Semenov and Stanislav Sedov. You can watch the online version of the reportage on "YouTube"
Tomorrow our photographer Dmitry Moiseenko is flying to get a shot of Everest. The photo session from 6500 meters is going to be extremely difficult. The outsite temperature is expected as low as -35 °C (-31 °F). Good luck Dima and we hope the good weather will be with you! CNN called us and Sergey Semenov gave them an interview by Skype. After that CNN made the reportage "UFO takes awesome pictures". You can also watch this reportage on "YouTube"
The first prize in the category Landscape of Travel Photography of Russia 2011 contest held in the frameworks of Russian Photographic Travel Festival III - PHOTOTRAVEL-2011 was given to the creative work Music of the Wave by our colleague Sergey Rumyantsev. 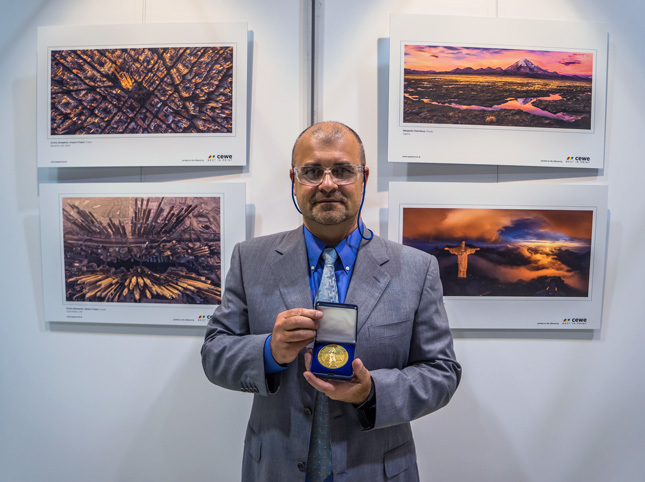 Oleg Gaponyuk was awarded with two diplomas at once of Travel Photography of Russia 2011 contest held in the frameworks of Russian Photographic Travel Festival III - PHOTOTRAVEL-2011. 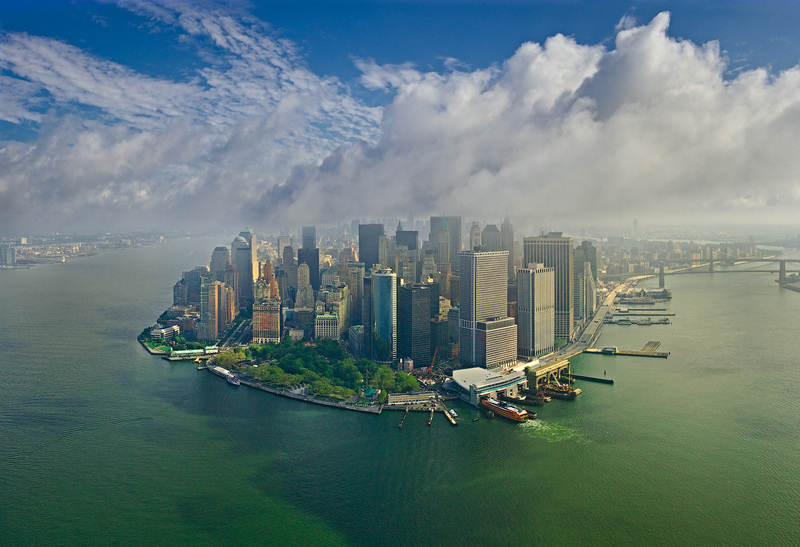 The creative works Manhattan took the second prize in the category Urban Landscape among the professional photographers. 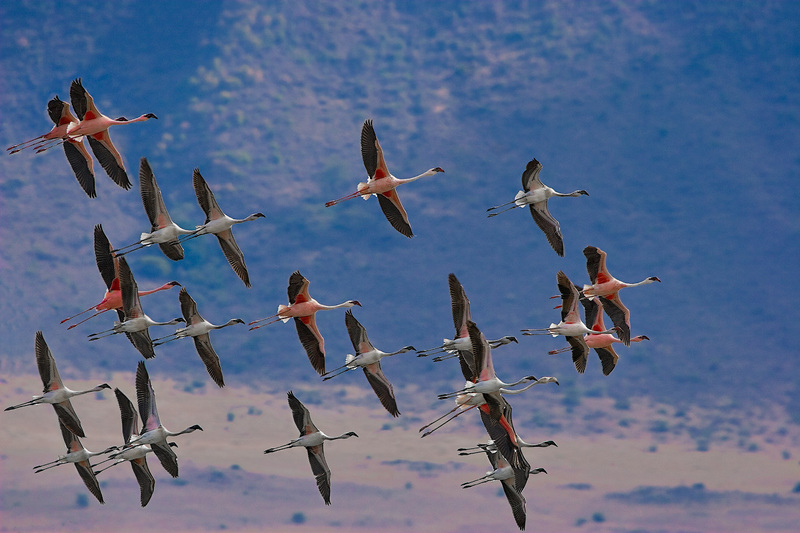 The creative work Flamingo was awarded with the third prize in the category Animal Photography among the professional photographers. Our project was included in the gallery Google Earth in Travel and Tourism section. You can download KML file whih contains our panoramas from here. 3D model of our planet (with height above sea level), which is viewed on a monitor's screen, is used in Google Earth. The main difference between Google Earth and well-known Google Maps consists exactly in the 3D-lanscapes of the Earth's surface. You can find our project both in online version of Google Earth and directly in the section Gallery of Google Earth in your computer. Sergey Semenov with the co-author Oleg Gaponyuk (Olevka) won Grand Prix in the prestigious contest of Ru.Net - Photosight Russian Awards 2011 with the creative work The Photo of Sergey Semenov Is Observing Manhattan from the Window of the Millennium Hotel. Photosight is the largest Russian Internet resource devoted to Author's Art Photography. Oleg Gaponyuk (Olevka) won in the prestigious contest of Ru.Net - Photosight Russian Awards 2011, nomination Our Cities with his creative work Kuala Lumpur. Photosight is the largest Russian Internet resource devoted to Author's Art Photography. The winners of the national contest Landscape of Russia were announced. There are three creative works by Sergey Rumyantsev and Sergey Semenov among the finalists. The photo by Sergey Rumyantsev "Fishing. Series - Children of the Outskirts" took the second prize in the category "Man and Landscape". The creative work "In the Morning" by Sergey Semenov was honoured with the special prize of the National Geographic Traveler. The open air exhibition of the best creative works is opened on Manezhnaya Square between the Moskva Hotel and Okhotniy Ryad shopping mall from September,01 till October,15. On September 7, 2011 at 7p.m. in the exhibition hall of the Center of Development and Entrepreneurship of Moscow Eastern Autonomous District (Srednyaya Pervomayskaya st. 3, floor 3) will take part the SECOND MASTER-CLASS by the leading photographer and stitch&processing master of AirPano.ru - Sergey Semenov. Admission is free. Advanced booking is needed. In September edition of the US magazine for pilots - the Plane&Pilot (http://www.planeandpilotmag.com/) - there is a double-page photo made by one of our photographers Sergey Semenov. Now US readers can also enjoy the unique shot of Kremlin, Red Square and the flying group Golden Eagles made during the parade rehearsal in the honor of 65 years of the Great Victory. Like it usually happens, we appeared in the magazine accidently enough. In May one of the Plane&Pilot's publishers was in Russia and, walking along Tverskoy Boulevard, saw this photo which was being exposed in the frameworks of the World Seen by the Russians exhibition and Sergey Semenov was its participant. In May edition of the Photographer magazine (05/2011) appeared big 20-page article about AirPano project. The article represents an interview between Oleg Gaponyuk and the chief editor of the magazine Evgeny Zubenko where Oleg tells about the history of his project, photography techniques in use and shares his knowledge in shooting as well as the future plans. Our photo of Jesus Christ Statue on the top of Corcovado Mount in Rio de Janeiro is on the cover of the magazine. And the virtual tour over Rio can be viewed right here. In July edition of the Photomasterskaya Magazine (N74, 2011), Expert section, the article about AirPano project along with a feature story by Sergey Semenov were published. His feature story is dedicated to the planet stitching methods from plain projections of spherical panoramas in Photoshop. On 29-th of June at 7 p.m. in the exhibition hall of the Center of Development and Entrepreneurship of Moscow Eastern Autonomous District (Srednyaya Pervomayskaya st. 3, floor 3) will take part a Master-Class of the leading photographer and stitch&processing master of AirPano.ru - Sergey Semenov. The master-class is devoted to the basic techniques of Art Landscape Photography and special details of panoramas' shooting beginning with the basic principles, correct choice of proper equipment (tripod, panoramic head and objectives) as well as camera's adjustments and ending with conversion of files, stitching and processing of panoramas. Also, the difficult cases will be discussed: shooting when camera is out of the window or roof, 360⁰-shooting, HDR panoramas shooting, shooting of spheres, gig-panoramas, shooting under fast-changing conditions and in trips as well as aerial photo shooting of panoramas and spheres. To attend the master-class your personal information such as your first and last names as well as tel. number and e-mail address is needed to be sent to konkurs@photovao.ru or karpovaev@crp-vao.ru. There was a publication (08.06.2011) in the Metro newspaper about our virtual tour in the sky of St. Petersburg. This shooting became one of the longest and most complicated but simultaneously one of the most popular creative works between our viewers. FYI: the Metro newspaper is the most read daily newspaper in Russia. Today our server has moved to Germany for its permanent location there because Russian hosting hasn't got an ability to deal with the increased number of our site's visitors. We hope that the times of "Service Temporary Unavailable" page have already passed. If you face any trouble in the functioning of our site, please, don't hesitate to contact us! This will help us to improve its work in future. Recently Dima had a helicopter flight over the half of Iceland but the volcano was covered with clouds and he wasn't able to shoot. This time he was able to rich the Grimsvotn volcano crater by the car and on foot. So, read the second part of the story from Dmitry Moiseenko. In spite of the active stage of the volcano's eruption has already finished and there is only a stream of 100 meters height left from 20 km steam and ashes jet, we, however, decided to fly till the volcano as we were able to reach Iceland. Below you can find D. Moiseenko's story about the flight. Frankly speaking, last year another volcano named Eyjafjatlajökudl (the name rose from my memory) had almost finished its eruption too when we were close to its crater. So, we could only enjoy the steam clouds. On Hawaii red-hot lava stopped flowing onto the sea when our helicopter flew there. We left and next day the lava flow recommenced. Second Prize of the First National Photo-Awards "Best Photographer-2010"
Oleg Gaponyuk took the second prize of the First Opened National Photo-Awards "Best Photographer-2010" (Bestphotographer.ru) in category Architecture http://bestphotographer.ru/winners. Since the 26-th till the 29-th of May in the Center of Photography Behalf of the Lumiere Brothers the creative works of the winners will be exposed. 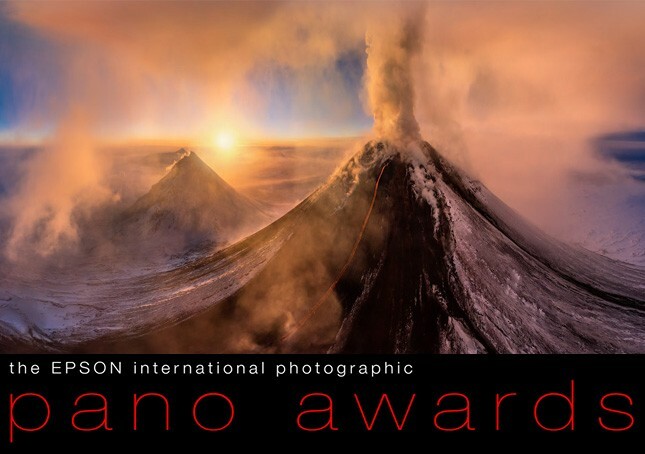 AirPano took part in the international contest of panoramic photography Epson International Pano Awards 2011 http://www.thepanoawards.com/. Our team took the first and the second prizes in category Architecture as well as the third prize in category Spherical Panoramas with the total award amount about $8000. Besides, the creative work of Oleg Gaponyuk took the contest's Grand Prix and became the best work among the others. This winter Stas Sedov has become a member of AirPano.ru team. Stas is a pilot with a great practical experience as well as a constructor of flying radio controlled platforms for photo and video shooting. We met Stas in May last year and the result of our mutual cooperation was the shooting of our first spheres in Moscow. Stas is a head of Radio Controlled Models Department of AirPano. An elaboration of a computer-aided flying system for a spherical panoramas distance shooting, the shooting of aerial movie and TV-project scenes, a 360 video methods creation and the aerial photo shooting which supposes the use of professional equipment are in our plans. In short time we'll represent several interesting projects shot with the radio controlled model. Oleg Gaponyuk (Olevka) became a winner in a prestigious contest of Runet which is Photosight Russian Awards 2010 in the nomination of Our Nature. Awards'10 with his creative work Goose necks. Photosight is the largest Internet resource in Russian segment devoted to author's art photography. 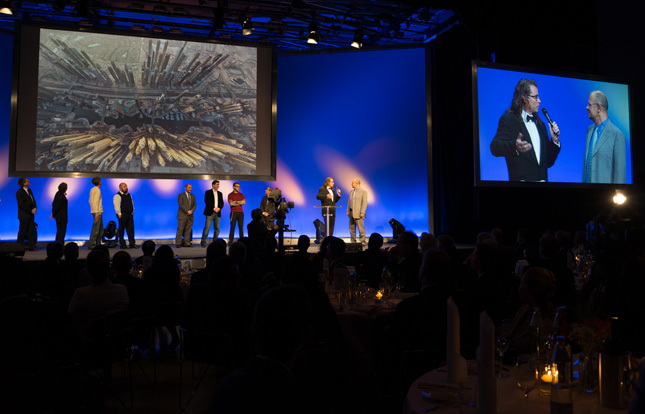 The award ceremony held in Crocus Expo in the frameworks of Photoforum-2011 exhibition on April 16. The open-air exhibition on Tverskoy Boulevard will take place from April 23, 2011 till June 30, 2011. AirPano team participants Oleg Gaponyuk, Mike Reyfman and Sergey Semenov will take part in this event. Here you can see the reportage from the last year exhibition right on your computer monitor. Last October we shot in St. Petersburg. Along with art photography one of the tasks was the training in creation in the air of ultra high resolution panoramas. Finally, our developments were successfully practically tested and in the air of St. Petersburg the panoramas of 18.000x9.000 resolution were shot. That, as we know, hasn't been realized by anybody in the world yet. In order the panorama's demonstration is good a very powerful computer is needed to view images made in such high resolution and, unfortunately, everybody hasn't got such kind of computer. Another alternative way is to show panoramas part by part when the computer downloads exactly the part which is being viewed by a spectator. This way is widely used in the Internet to demonstrate Giga-pixel panoramas shot from the Earth. 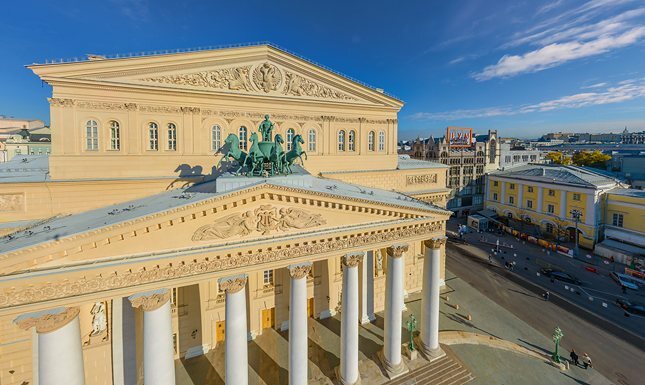 At present time we are finishing processing the ultra high resolution panoramas shot over St. Petersburg and in the nearest time they will be exposed on the site. Golden Tortoise 5 Awards held and the winners and laureates were chosen. Sergey Rumiantsev's work named Life in Ice became a prize winner in Life Harmony nomination. The winners of Golden Tortoise 5 contest can be seen here. Today our colleague and excellent photographer Dima Moiseenko takes off to the other end of the Earth, to Venezuela, for shooting Angel Fall - the highest waterfall in the world where water falls from the height of one thousand meters just changing into water spray at the bottom. Let's wish him fine weather and good luck! In the "Digital Photo" magazine №93 (January 2011), in the article about photo-safari titled Those Who Have Traveled Round Earth Three Times the interview and photos by Oleg Gaponyuk were published. The spherical panoramas creating in the sky supposes that a flying machine hovers in the air (as a rule, it is a helicopter or a radio-controlled model) and revolves on its axis. However, there were no helicopters on Maldives and for the first time in our practice we had to shoot a spherical panorama from a seaplane... Oh, that wasn't the easiest thing to make a pilot stop the seaplane in the air and rotate it J But we succeeded in doing it. The results of the shooting you can see here. In February edition of the Foto&Video magazine the article titled Ice Land by Sergey Rumiantsev was published. The article is devoted to our travel to Iceland. This year five works by Oleg Gaponyuk, Sergey Semenov and Sergey Rumiantsev reached the finals and ending exhibition of Golden Tortoise 2010 contest. The finalists' works will be exhibited from the 11-th till the 27-th of March 2011 in New Manège, Moscow city. The authors are Dmitry Arkhipov and Oleg Gaponyuk. December 22 till January 9. On December 24, Friday, the grand opening of Five Sides of the World of Oleg Gaponyuk and Dmitry Arkhipov, landscape exhibitions, took place. The exhibition will be opened till January 9 in the Central House of Artists on Krymskiy Val. Here is the virtual tour from the grand opening . 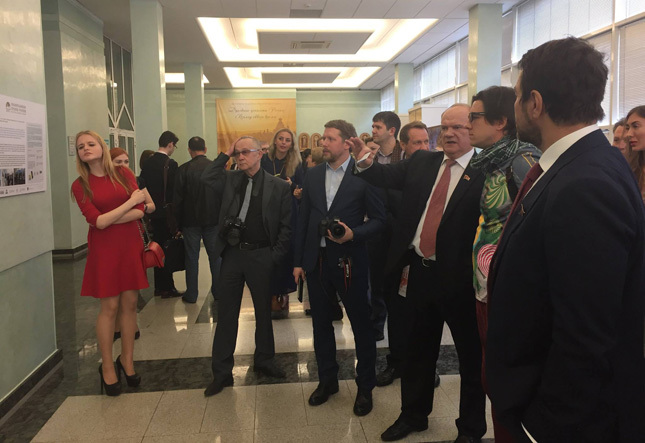 The photo-exhibition of Dmitry Arkhipov and Oleg Gaponyuk named Five Sides of the World will take place in hall 9 on the second floor of the Central House of Artists. The zest of the exhibition is, undoubtedly, a size of the exposing works. On the 2-meter canvases the landscapes are becoming alive and fully show us an amazing beauty of the nature . Invitation: Dear Friends, we invite all of you to visit the grand opening of the exhibition, which will hold on December 24 at 18:00. On December 24 from 16:00 you can visit the exhibition free, having printed our invitation. In November we shot on Maldives, Mauritius, in Bangkok, Sidney and on the South-West of the USA. In November we shot on Maldives, Mauritius, in Bangkok, Sidney and on the South-West of the USA. Besides, we mastered an underwater panoramic shooting and its results will be represented on the site very soon. 1) First, we made a virtual tour over the interchanges of Moscow Encircling Highway (MEH). 2) The sphere was shot from the height of 1000m. The most part of Moscow and its region can be viewed from that point. 3) In May 2010 near Crocus-City Moscow panorama of high resolution (approx 1 Gig pixel) was shot from the height of 1000m. 4) In Moscow itself we realized several photo-sessions with a radio-controlled helicopter. In October edition of the National Geographic Russia under the heading Photomaster the publication of Oleg Gaponyuk's works and a short article about AirPano.ru appeared. Our helicopter shooting in St. Petersburg has been held. The sun was shining for 2 days and we could arrive from Moscow to shoot. After that the weather became bad again. Now the files are passing through the military legalization procedure and soon we'll able to show the shots on the site. We realized test technical shooting from a helicopter in St. Petersburg we were preparing for almost a year. We flew by a huge helicopter Mi-8. We tried to realize this shooting just in August when had come in St. Petersburg, but we were not lucky in weather: it was raining and we just measured the helicopter with a tape measure J Then the shooting was successful and now we are planning to make a virtual tour over the city on the Neva River if we are lucky. We are grateful to the Aeroecology Company for the flight organization. 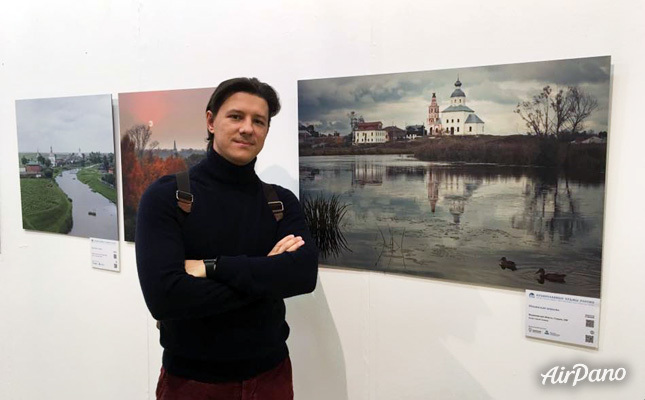 After Moscow and St. Petersburg the open-air exhibition «World Seen by the Russians» , in which AirPano.ru represented by Oleg Gaponyuk takes part, is moving to Veliky Novgorod, in the Kremlin. It will last from August 3, 2010 till August 23, 2010. Welcome! There is a new panorama over the Statue of Liberty Unfortunately, the pilot couldn’t go closer though before the start had promised to go 100 meters close to the statue. In this case we would see the tourists walking inside the crown on head of the Liberty. Here it is the link to the panorama over the Statue of Liberty . We took part in World Wide Panorama in Forgotten Places contest. Here it is our panorama shot in the Alps at a height of 4700 meters. It is accompanied with the sounds of wind gusts and helicopter (it is recommended to turn the volume up). Here it is a full screen version (unfortunately, it isn’t accompanied with sound but it’s convenient to be viewed). In 2008 I decided to visit New Zealand for a couple of weeks to be sure that The Lord of the Rings was really shot there :) The way to New Zealand was very long and took more than 24 hours, and I had to change a plane twice: in Dubai and in Sidney. On my way back I decided to stay for a night in Sidney, because it is one of the most beautiful cities of the planet, and this visit didn’t require getting Australian visa. In the morning before leaving for the airport I found the contacts of a helicopter operator in a phone directory and shot several panoramas in the harbour near the world-known Opera House. It was two years ago but only now we have got time to work with the materials of those photo-session. That time we still couldn't shoot the high resolution spheres that is why Sidney shooting is represented in its usual quality. Had a look to calendar, we understood that the World Cup Football Championship will begin in several days. We thought that it would be great to represent on the site something pro-football as a sign of such an interesting event. In the archive the SPHERE which had been shot in Cape Town in the beginning of 2010 was found. It was shot right over the Green Point Football Stadium which was being built that time and it is devoted to the World Cup Football Championship. There are still bulldozers on the project site in the sphere, but now the stadium is completely ready and on June, 11 at 20:30 it will be the match between the football teams of Uruguay and France on it. Open-air exhibition "World Seen by the Russians"
When the demonstration in Moscow is over, the open-air exhibition «World Seen by the Russians» , in which AirPano.ru represented by Oleg Gaponyuk takes part, will go on in the Alexander Garden (near the Russian Admiralty) in Saint Petersburg from June 11, 2010 till June 30, 2010. Welcome! Is it much or not for a photographer? This May we have been able to find an answer to this question. 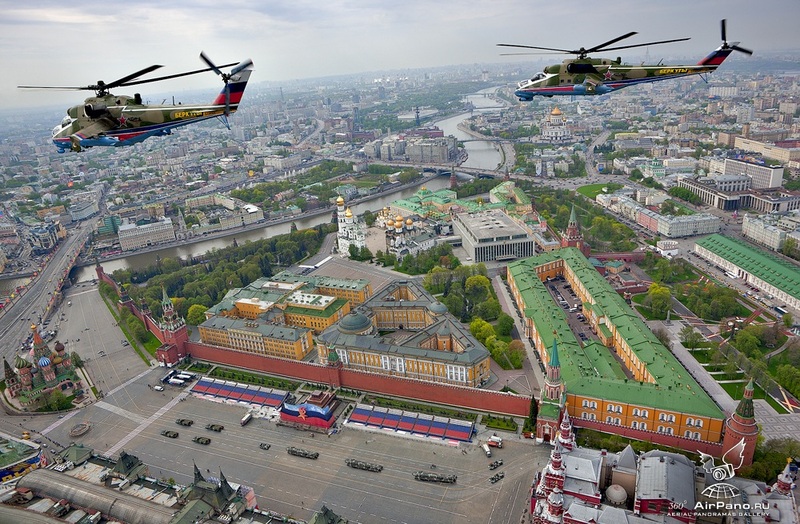 We could fly over Red Square on the board of one of the helicopters which took part in the Victory Parade rehearsal. It takes a helicopter 5 seconds to get St. Basil's Cathedral from the State Historical Museum at a speed of 250 km/h. It's necessary to have time to lean out of the window and overcoming the strong air flow to combine the shots which include closed flying helicopters and main points of Red Square. This shot was made by Sergey Semenov during the first Victory Parade rehearsal. A little bit later we'll tell you about the second shooting which was several days later. In the May edition of the PhotoDelo magazine there was our article Planet Earth devoted to AirPano.ru and panoramic photography. Last week in Moscow sky we shot several high resolution spherical panoramas. It was the start of “Moscow from Bird’s Eye View” Virtual Tour. Though even much time ago, still last year, we flew over all MEH (Moscow Encircling Highway), but we couldn’t fly over Moscow. The panoramas will be represented to be viewed soon. 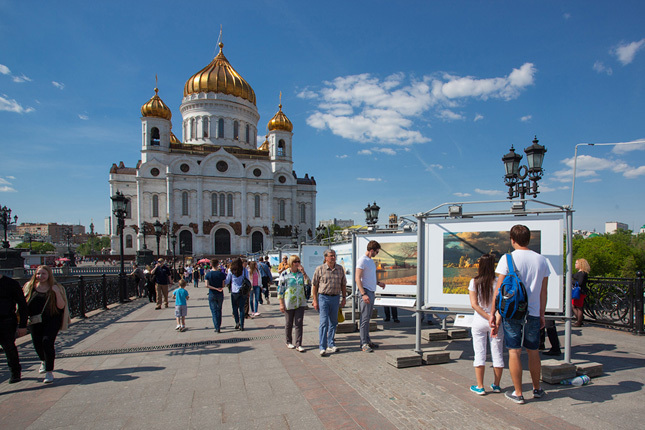 The «World seen by the Russians» open air exhibition, in which AirPano.ru from the part of Oleg Gaponyuk takes part and which are holding on Tverskoy Boulevard, will go on till the 1-st of June. Welcome! The entrance is free! Here you can see the reportage from this exhibition right on the screen of your monitor. The works on virtual helicopter tour over New-Jerusalem monastery of Resurrection in Istra have finished. New-Jerusalem monastery of Resurrection founded by Patriarch Nikon in year 1656 is one of the most complicated and interesting monuments of Russian spiritual culture. There are two panoramas available to view in our gallery. The works on virtual helicopter tour over The Holy Trinity-St. Sergius Lavra in Sergiev Posad have finished. The Trinity-St. Sergius Lavra (The Holy Trinity-St. Sergius Lavra according to the church publications) is the largest Russian orthodox monastery. There are eight panoramas available to view in our gallery. On the site there is a reportage about hard life of a sandwich inside a Zanussi oven. The Moscow Photoclub supported by the Photosafari Club presents the exhibition «World Seen by the Russians». This event will hold from April 20, 2010 till May 16, 2010 on Tverskoy Boulevard in Moscow under patronage of the Moscow City Government and supported by the Moscow City Department of Consumer Market and Services. The Airpano Team also represents its works there. A rare format of an open-air exhibition will allow thousands of Muscovites and Moscow visitors enjoying the art of photography. The best works of the last several years of travelling will be exhibited in the framework of the vernisage. of interior of cathedrals and churches. First aero-panorama of Victoria Falls! 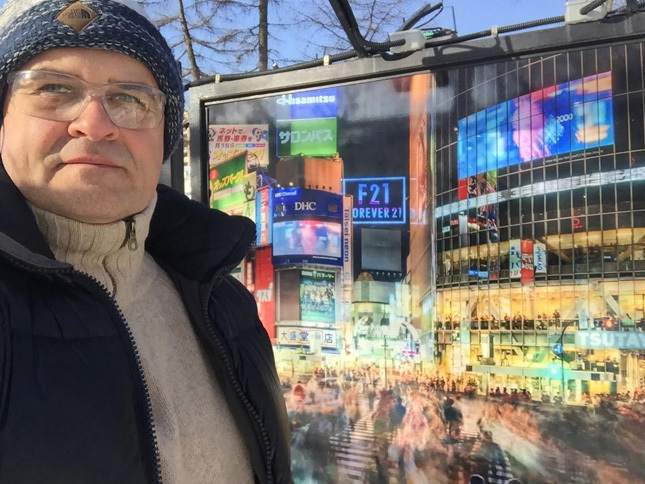 From April 1 till April 30, 2011 there will be the personal exhibition of Oleg Gaponyuk named Sides of the World in the Central House of Journalists (Moscow, Nikitsky Boulevard, 8a). Except traditional landscape photography, the creative works shot in the sky over the unique places of our planet's five continents will be exposed on the exhibition. On the two-meter canvases the landscapes are becoming alive completely opening an amazing nature beauty.